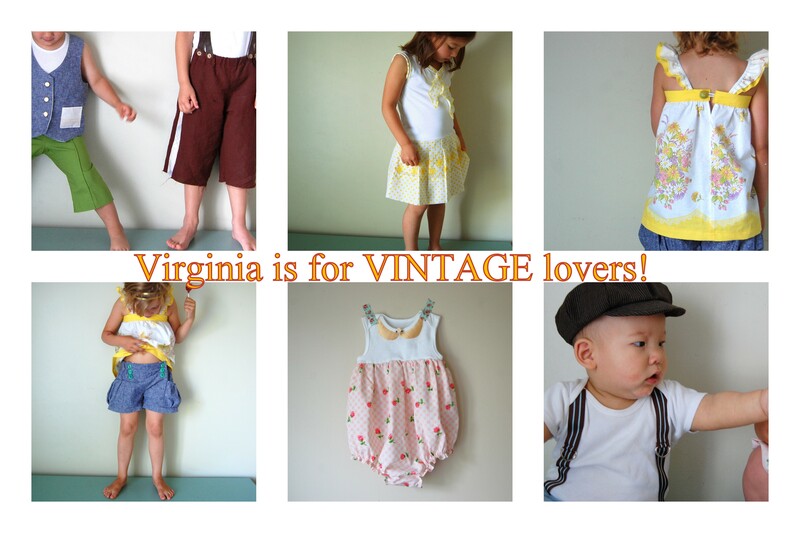 Vintage May :: Playclothes for all! We are so glad that Kristin and Jess invited us to participate in this year’s Vintage May series- and wow, what a line-up of talented ladies! If you are new here, Welcome! We are so happy you’re here. 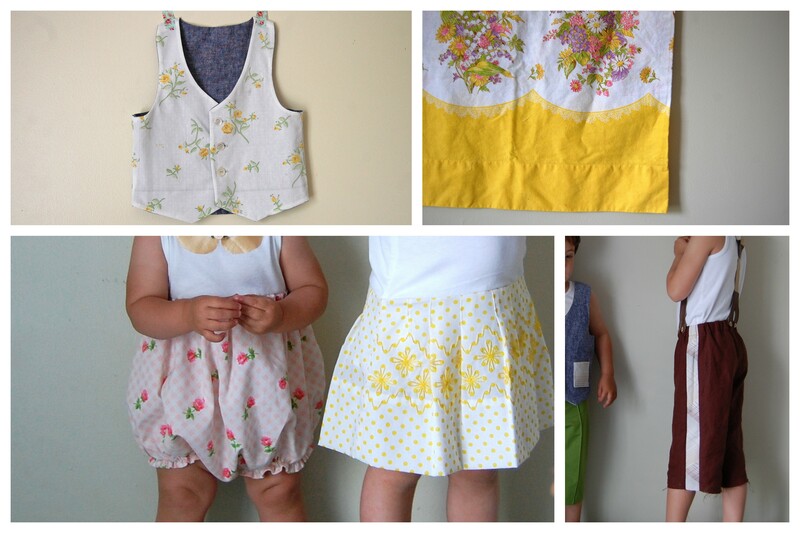 Last year, we sewed along during Vintage May, using floral sheets from yesteryear- here and here. 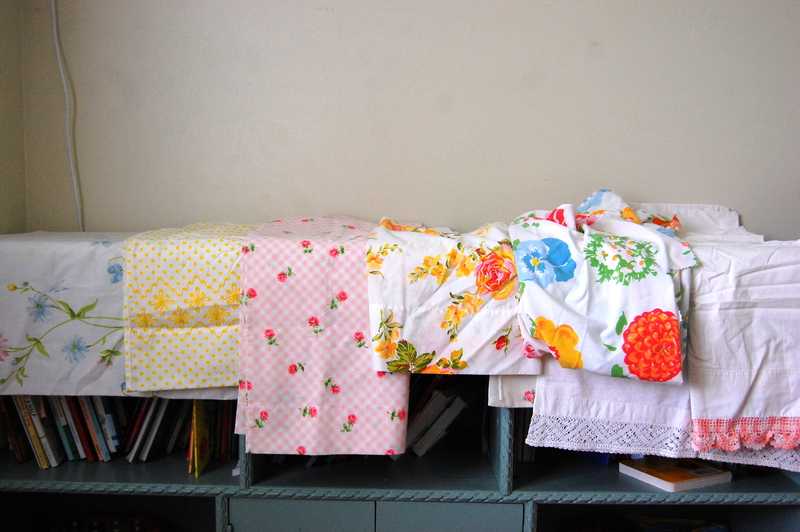 This year we got our Fraulein Maria on, repurposing bed linens into playclothes for our brood- that’s 6 kids altogether! Though our photo shoot reflects some nap-time delirium and lingering (and still lingering…) pink-eye- don’t worry, it ended with a full-on Vintage May/Gangnam-Style dance party! It only makes sense to start with the oldest… so here’s Jet! 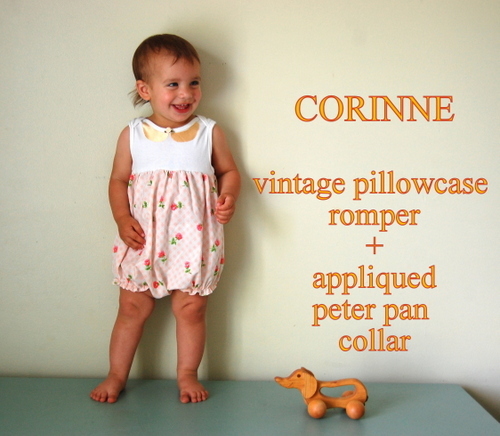 Caroline: Thinking about vintage looks for the boys, I kept coming back to this child actor, who was in some of our other favorite childhood movies (Swiss Family Robinson, Pollyanna, and Toby Tyler). You know him right? He’s the same in all those movies- scrappy, mischevious, and somewhat annoying. But he’s so cute in the hats and knickers and suspenders! 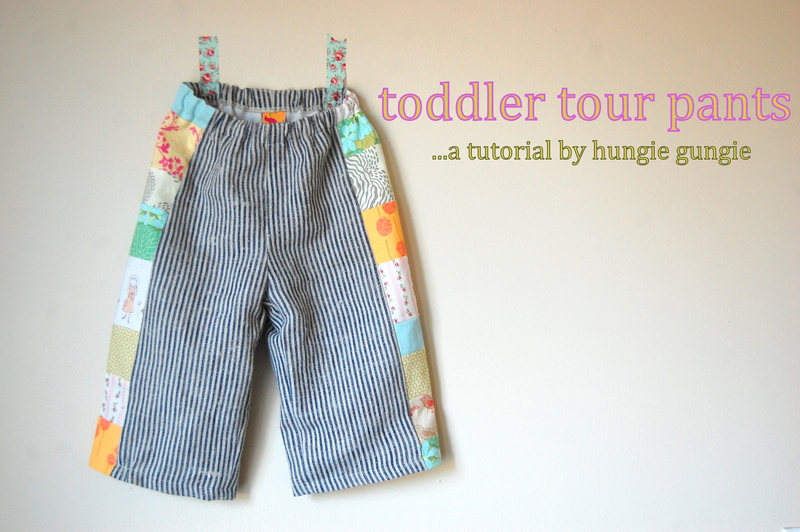 So for Jet, I worked up a pair of HG tour pants using a plaid pillowcase for the stripe. I decided to chop the pants below the knee to encourage summertime boyish mayhem. Get it? 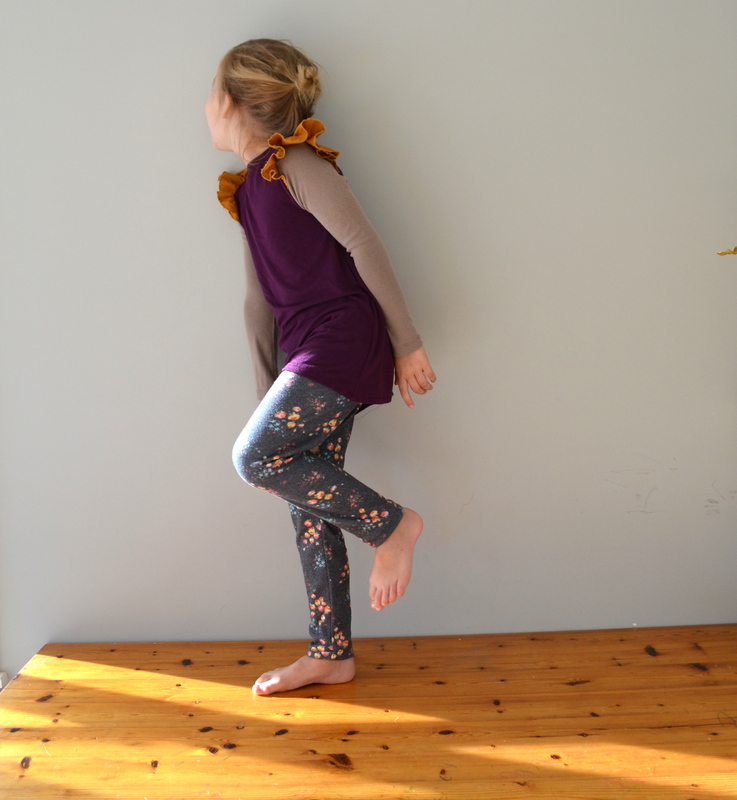 May–hem? I love a good sewing pun. 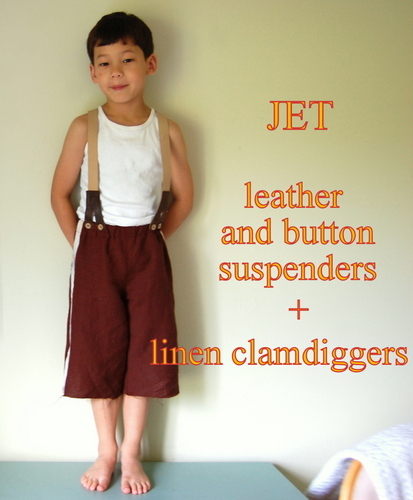 The suspenders are simply made with 1″ elastic, and upcycled leather + buttons. 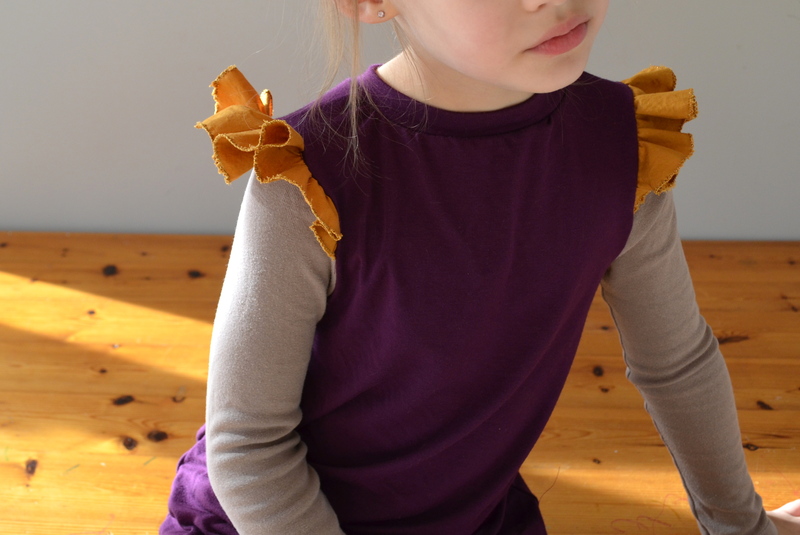 Erin: I fell in love with the details and colors of this pillowcase and knew right away that it needed to be a top for Ell. I utilized the entire thing. 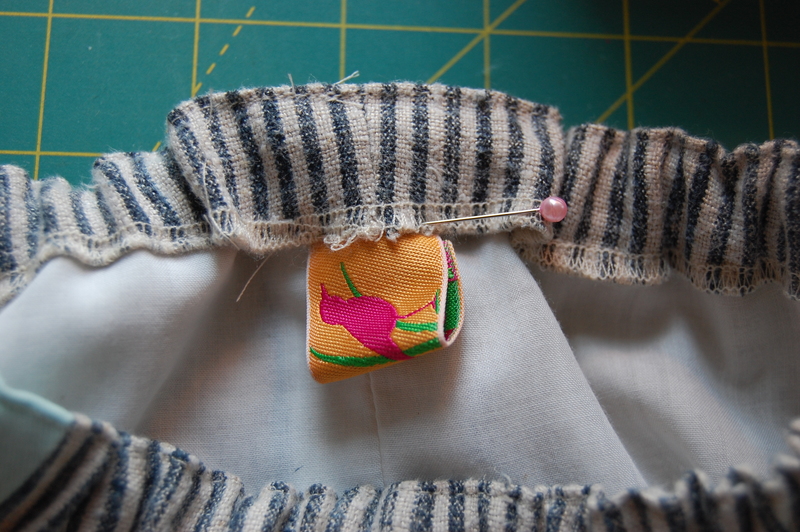 Normally, I’d leave the existing pillowcase hem for something like this, but I wanted to use the yellow in the flutter straps and the chest band, so I ended up cutting off a good chunk of the bottom. 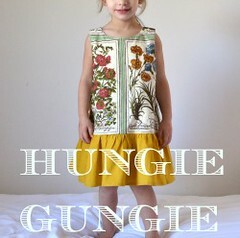 The back closes with a big vintage button and elastic loop. 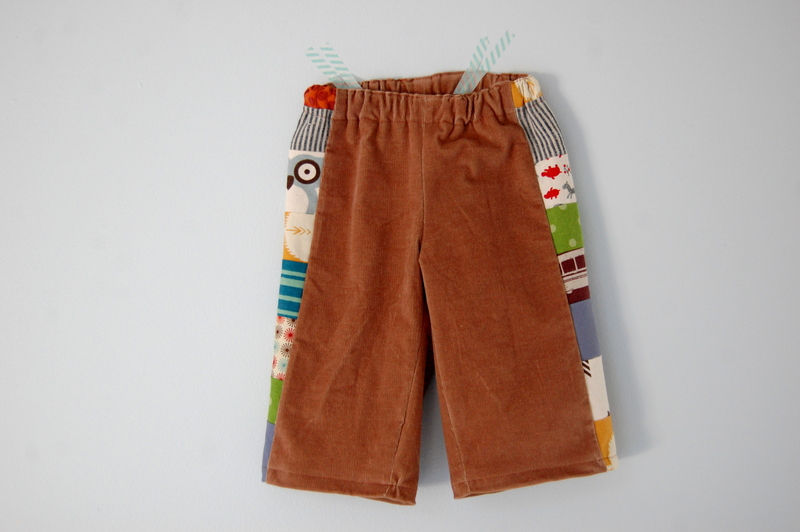 The shorts are E and E’s bubble pocket sailor shorts pattern in yarn-dyed Essex Linen. I love all the buttons! 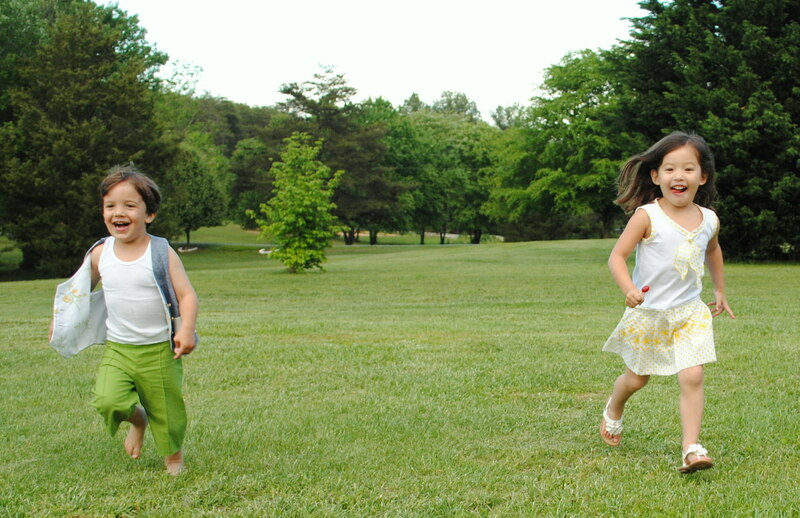 You can get a better glimpse of them up in that first picture. Caroline: Avery’s look is also reminiscent of Pollyanna. If you need a fix, watch this. 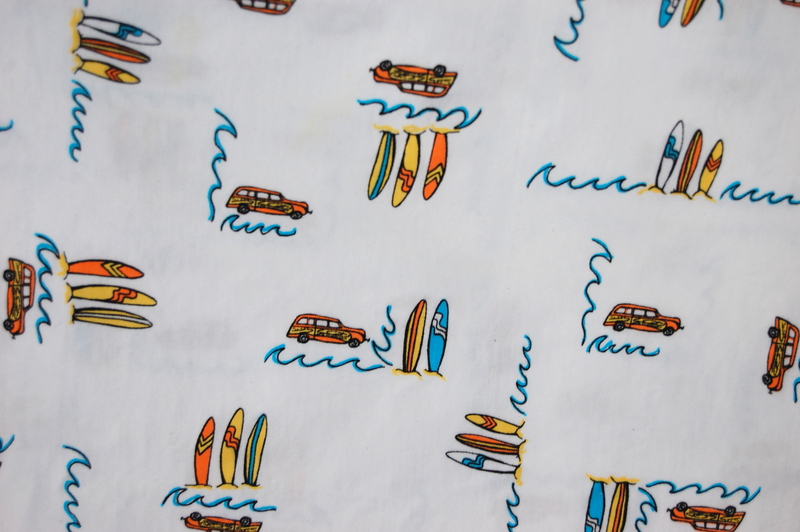 I loved her drop-waisted dresses and sailor ties. 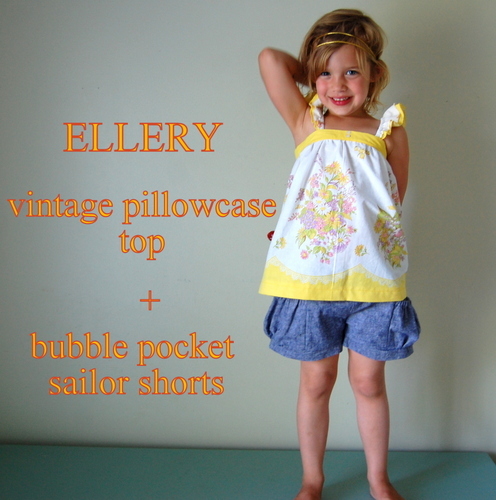 Avery’s modernized version (say if Pollyanna were to take up tennis) begins with a Flashback tee (minus the sleeves) on top and vintage pillowcase on the bottom. 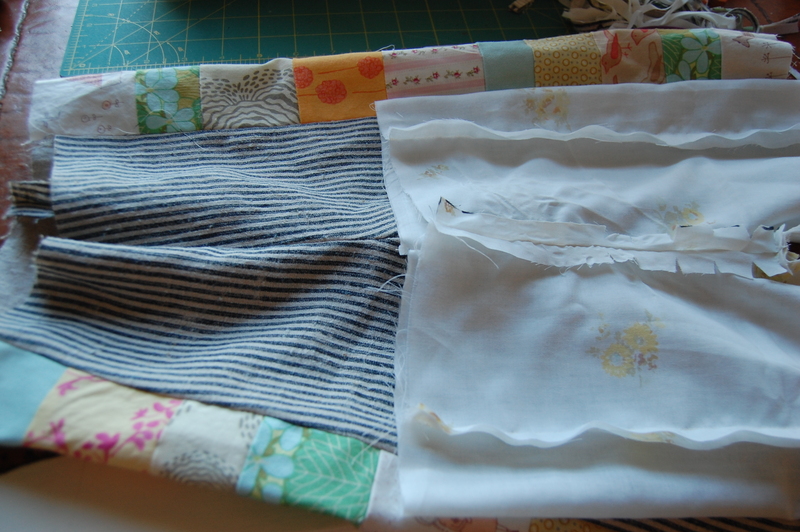 I simply cut the pillowcase in half and pleated it to match the circumference up top. 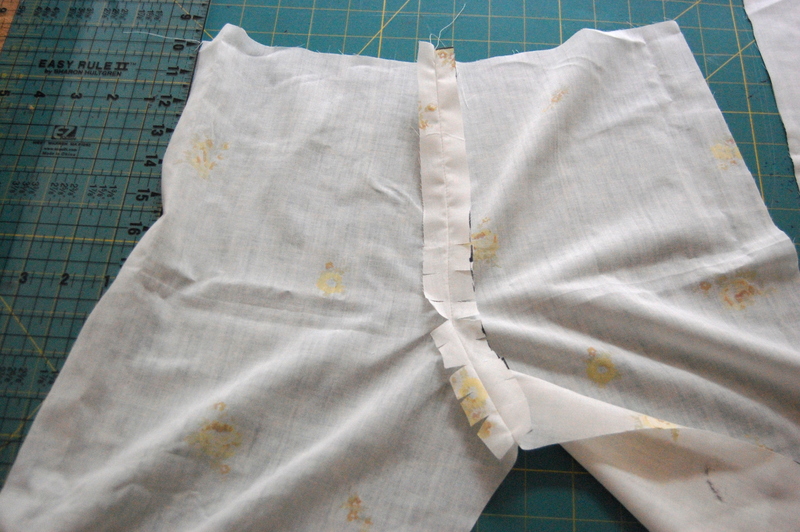 Using the same pillowcase, I made bias tape and stitched it around the collar and arm holes. 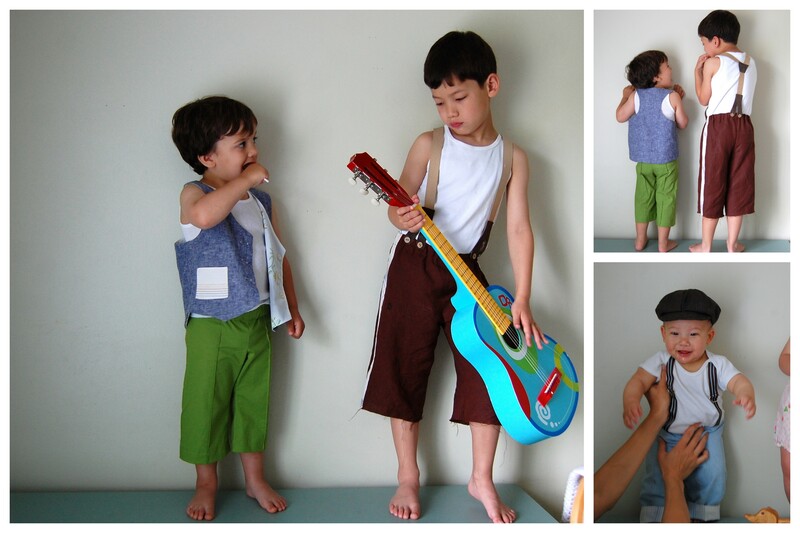 ERIN: I love the idea of little boys in vests, but it’s not a look you really see anymore. 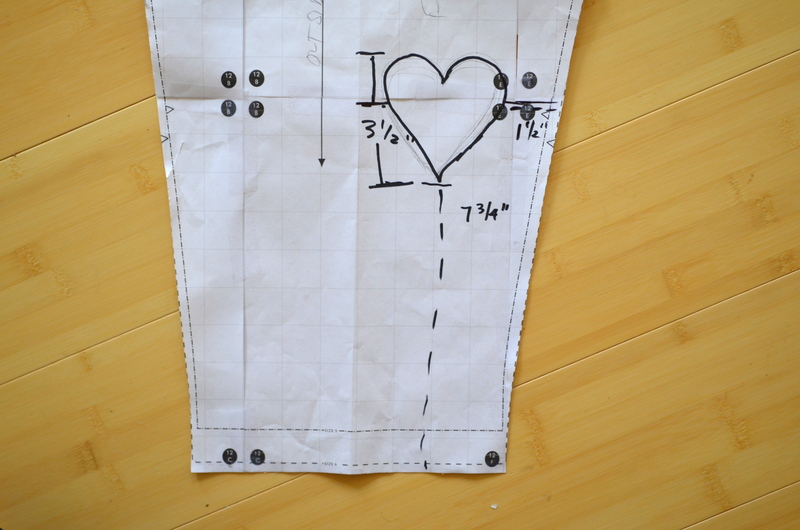 So, I decided to try one out for Grant using Lindsay’s tutorial modifying it into a racerback… and I love it! 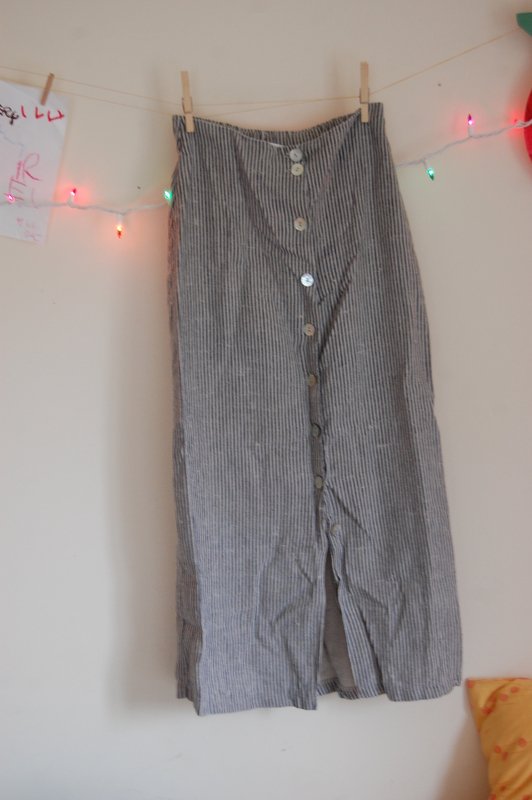 I made it with Essex linen (same as Ell’s shorts), and the pockets are cut from the hem of a pillowcase. 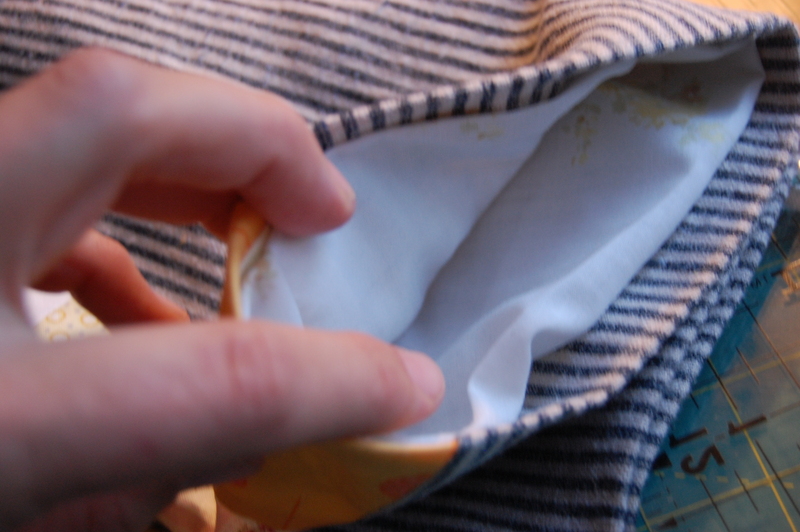 The inside is a pretty yellow floral sheet (the most masculine one I had). 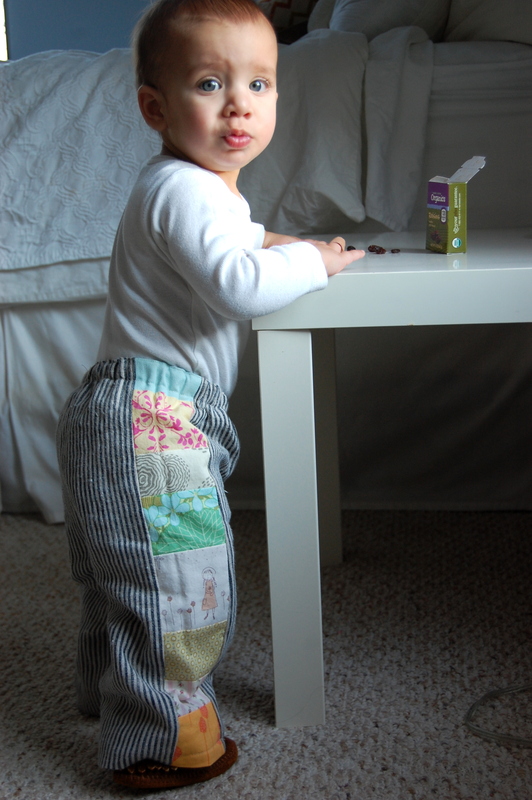 Grant’s pants are based on the Parsley pants pattern, but modified a bit to make them skinnier, and of course shorter. 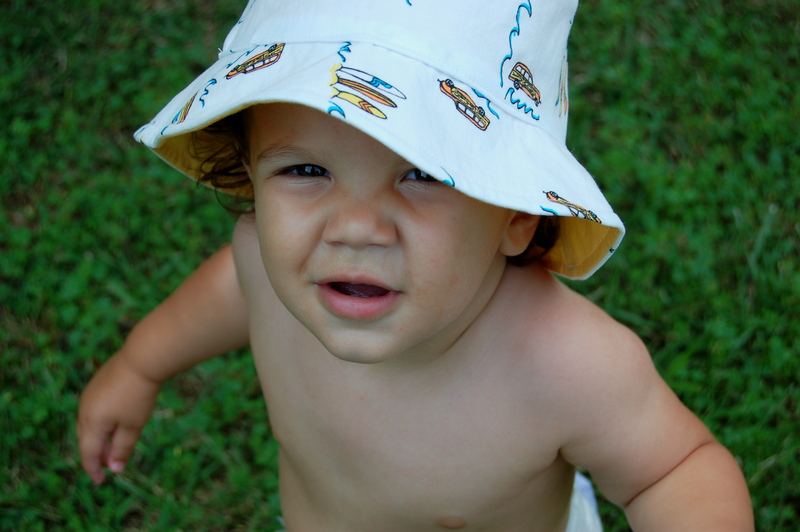 If we had a creek out back, you bet this boy would be wading it. 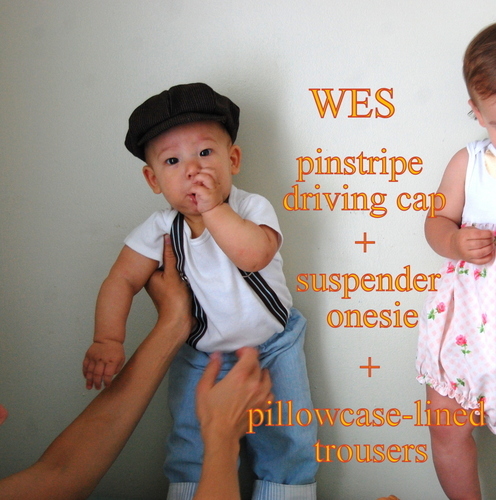 Caroline: Wes is wearing faux-suspenders (grosgrain ribbon, d-rings, steam-a-seam) attached to a onesie, along with pillowcase lined pants (based on A.M.H’s Quick Change Trousers). 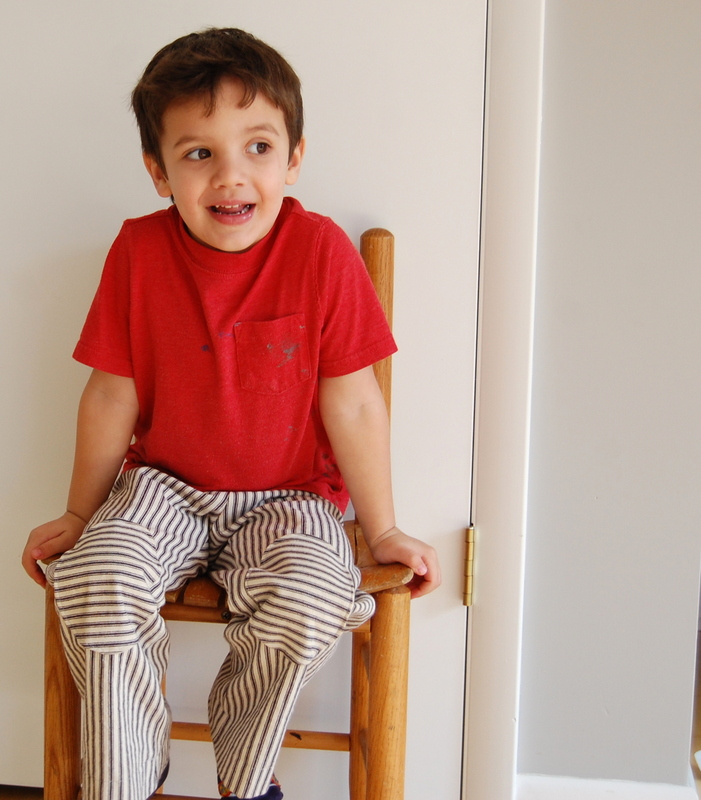 His newsboy cap is from this free online pattern/video tutorial that I found for an adult, and eventually had success with scaling it down for a small head. Do you remember this part in the Sound of Music? 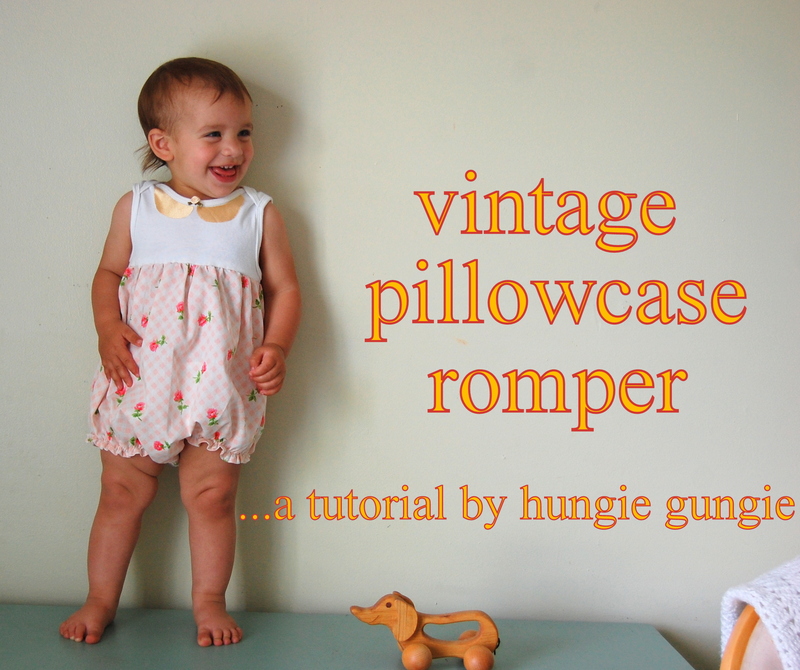 And if you know what’s good for you, check out today’s other Vintage May post by Jessica of Happy Together. Thanks again Kristin and Jess for letting us in on the fun! 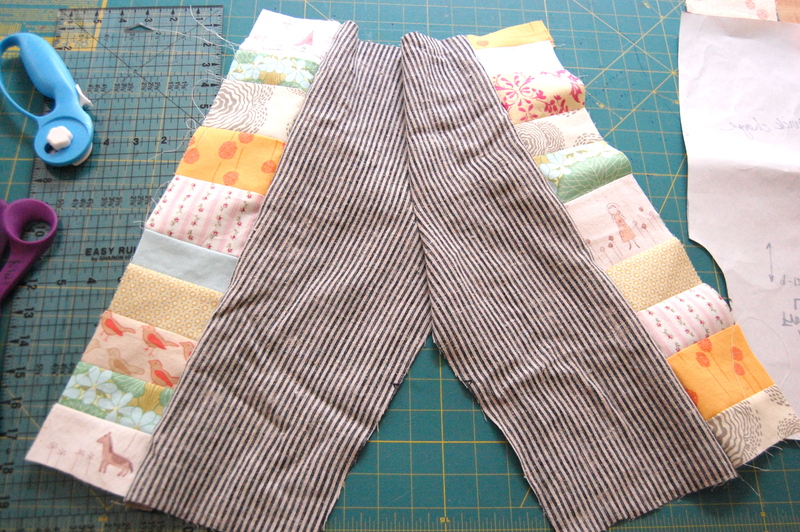 I’m probably dating myself with this post, but I’m sure some of you remember this hippie craze back in the late 90’s… patchwork pants!! The idea for these came to me in a flash when one of my best friend’s from highschool, Jay and his wife, Maegen had a baby this Fall. 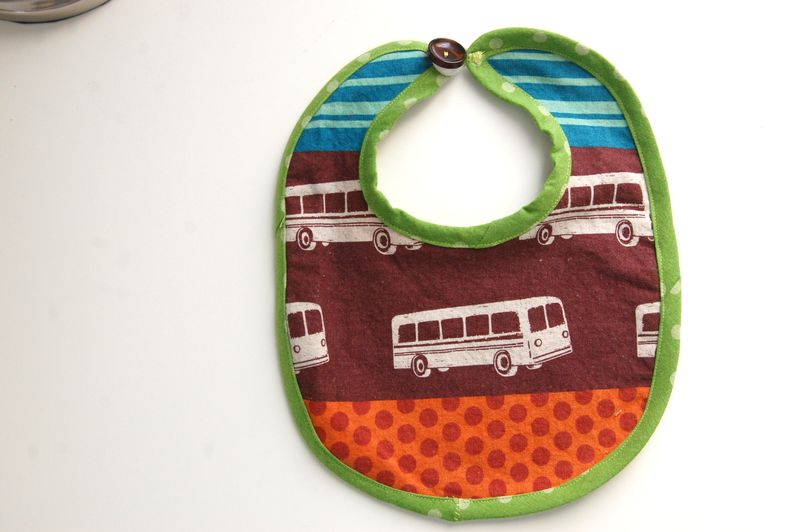 I wanted to make their little guy a gift but didn’t feel inspired to make my usual set of baby bibs…so these were born. 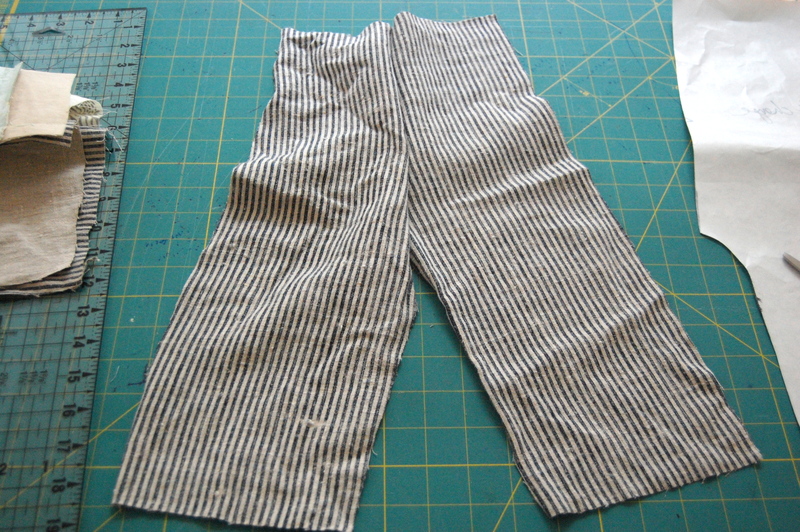 I thought it would be so fun to modernize these pants… by using some lighter fabrics (there was a lot of corduroy back in ’98! 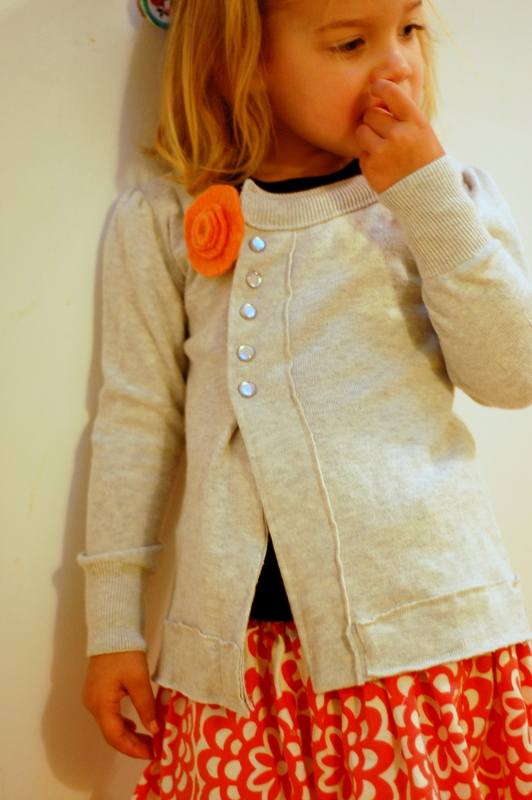 ), in softer colors. I think they are perfectly appropriate for a hip little baby! Maybe you knew a guy like Jay- A really nice/cool/funny guy, who liked Phish, the Dead, etc… went to school in Vermont, now has a super cool job working at Ben & Jerry’s- Bonaroo Buzz? Yeah, he pretty much invented it. I know…I’m jealous too. Jay still gets to jam out at shows from time to time too. So really, Jay (if you are reading this), you are the inspiration for these. 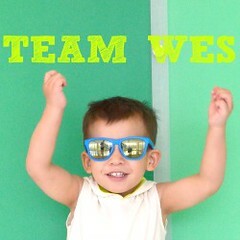 And your sweet little Chet will be recieving a boy version very soon! 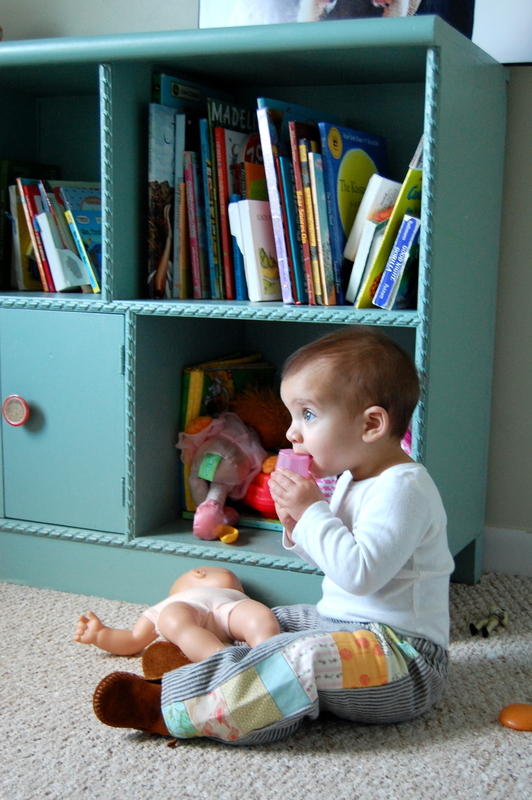 Here’s my 9 month old Corinne hanging out in her new duds… munching on some raisins…. oh, and she walks now. no big deal. !!!! 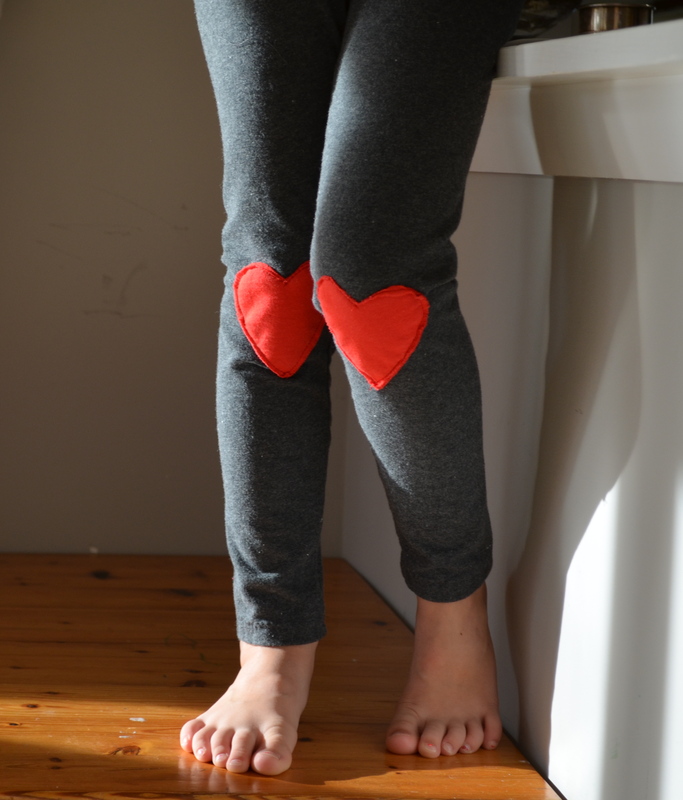 Shall we make some pants? 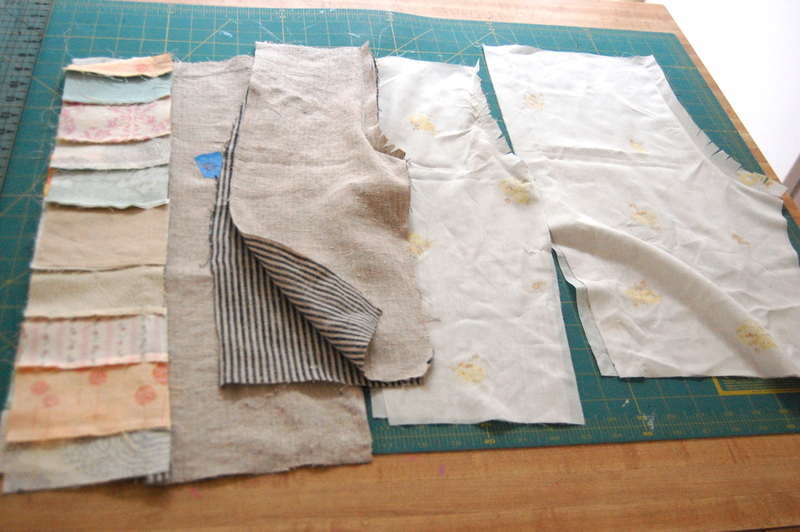 First, you’ll want to make your patchwork panels. 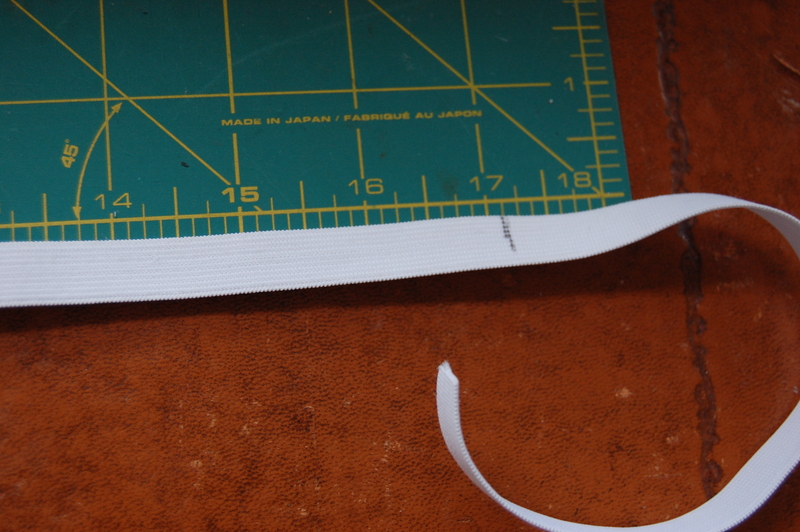 Cut your scraps to 4″ wide, and anywhere between 2″ and 4″ long. 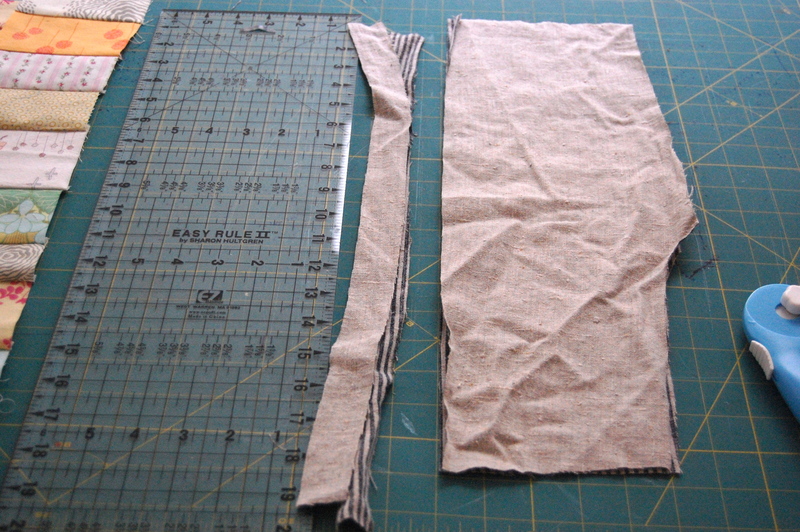 Sew them together to end up with 2 panels that are 4″ wide and as long as your pants pattern. Make sure you iron all the seams down. Set those panels aside when you’re done. 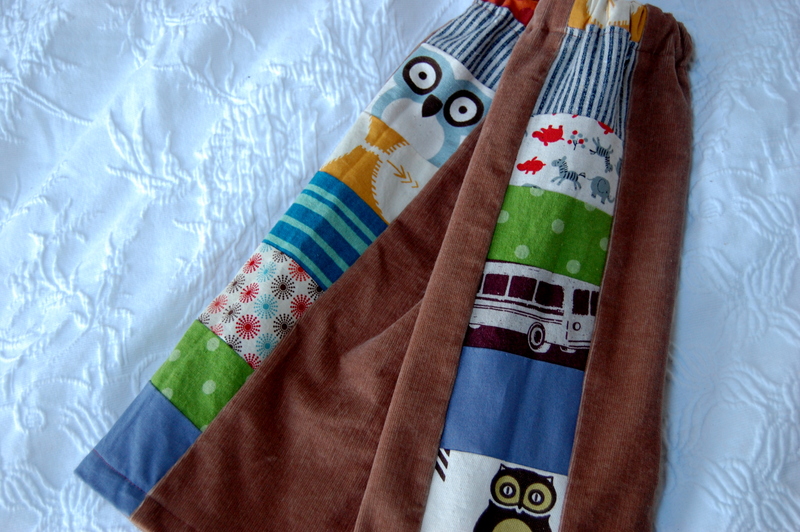 These pants are a great way to showcase some of your favorite fabrics, and of course a great way to use up scraps. 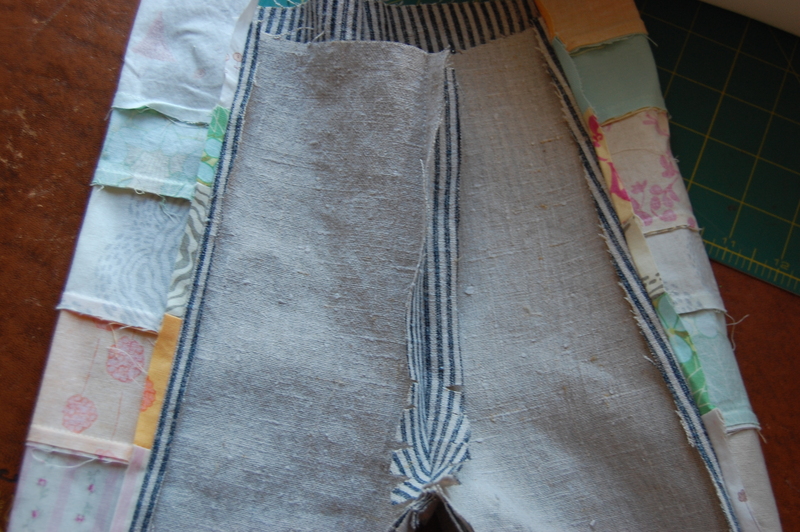 I’m using the Quick-Change Trousers from Anna Maria Horner’s book, Handmade Beginnings (though i altered the pattern by not using the back panel piece, and just extending the back piece to make them regular pants.) 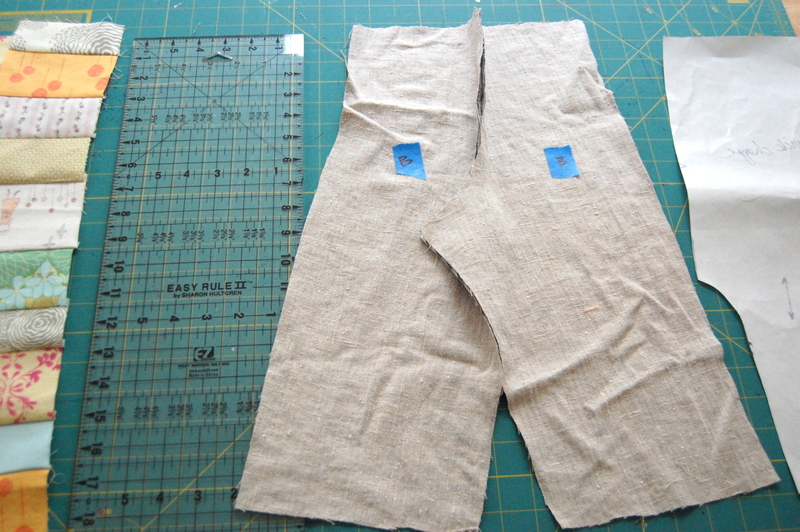 Dana has a few pants tutorials- i like this one where she shows you how to draft your own pattern from a pair of well-fitting pants you already own. …and 1″ off the side of your front pieces. 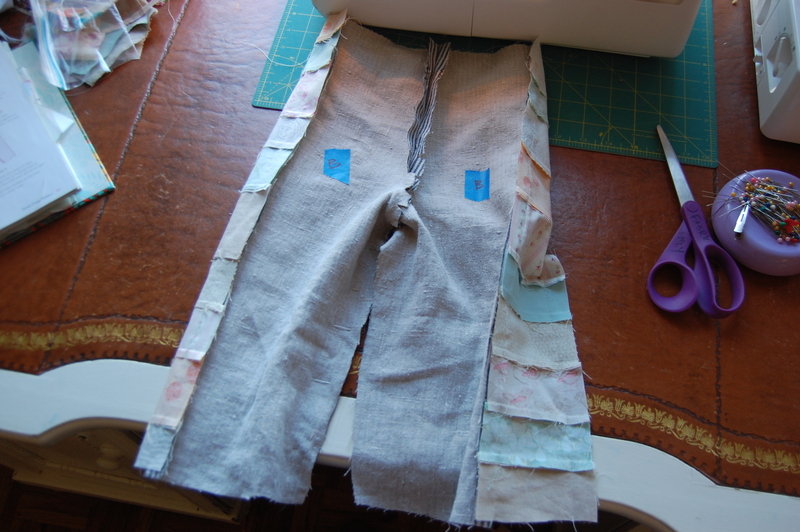 (these will end up being more wide-leg than your original pattern… adding about 2 inches of “room” to each pant leg of your finished pants). 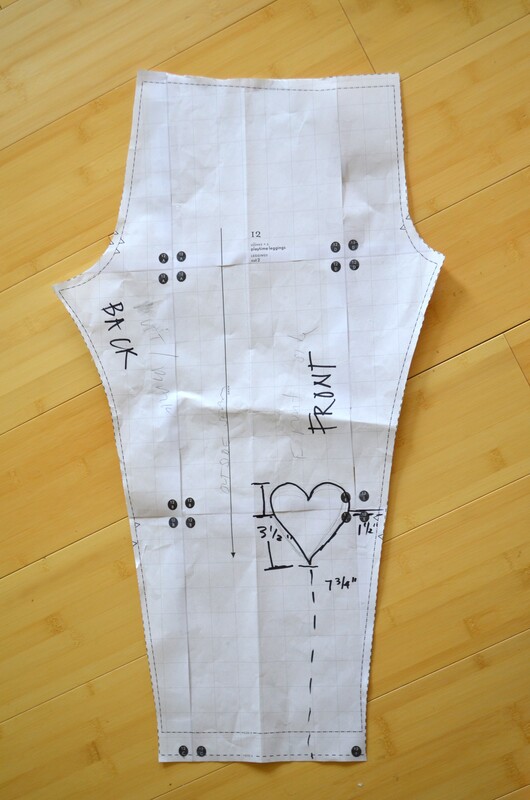 With right sides together, sew your back pieces (i always label the front and back pieces with tape since it can be hard to tell them apart!) 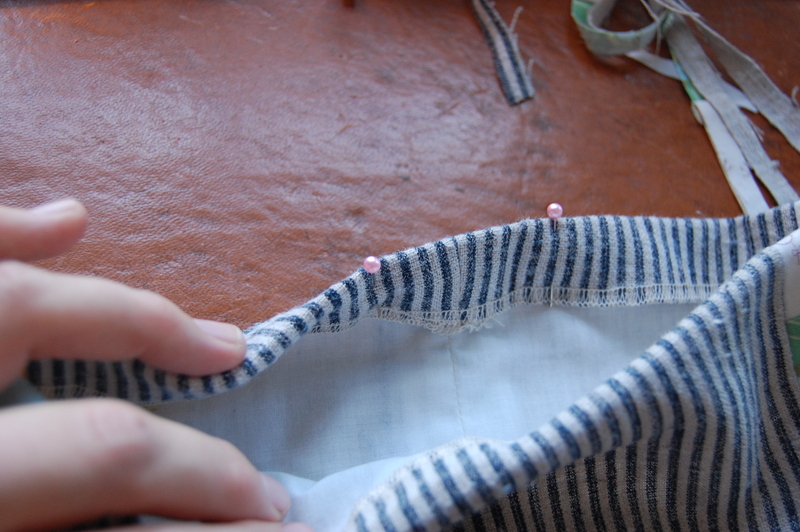 together at the center seam. Do the same for your front pieces…. 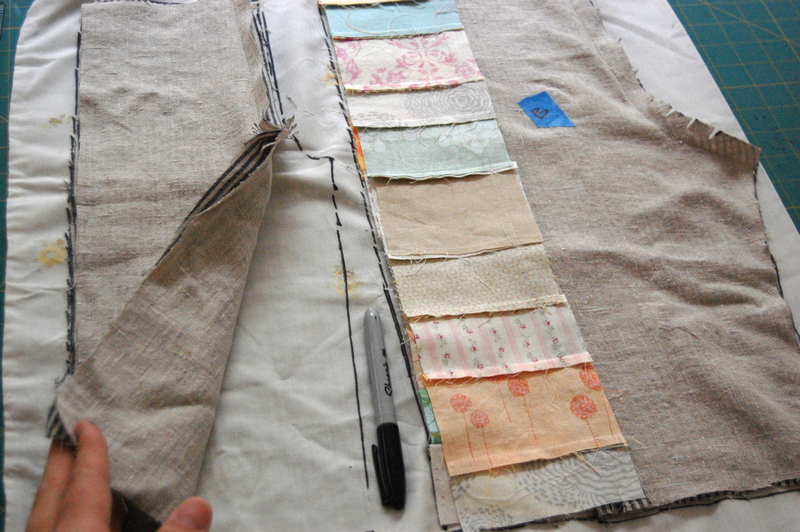 Next, with right sides together, sew your patchwork panels to your back piece. 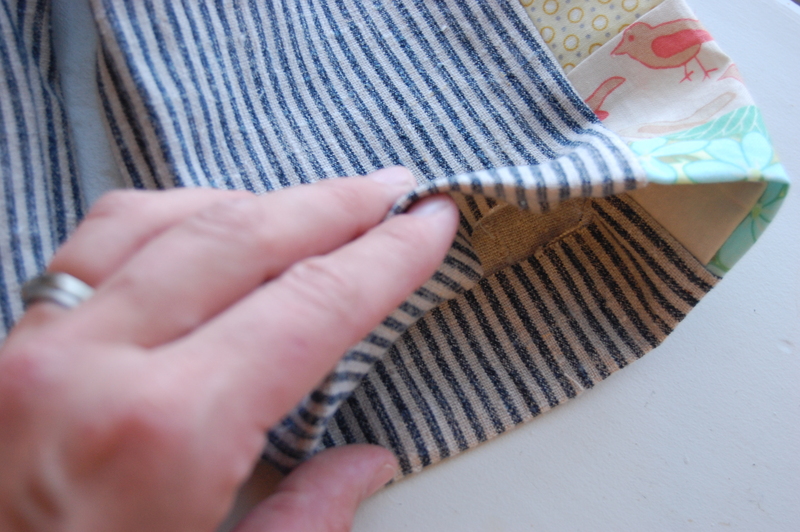 Should look something like this… oh, and press those center seams flat! Okay, your back piece should now look like this! 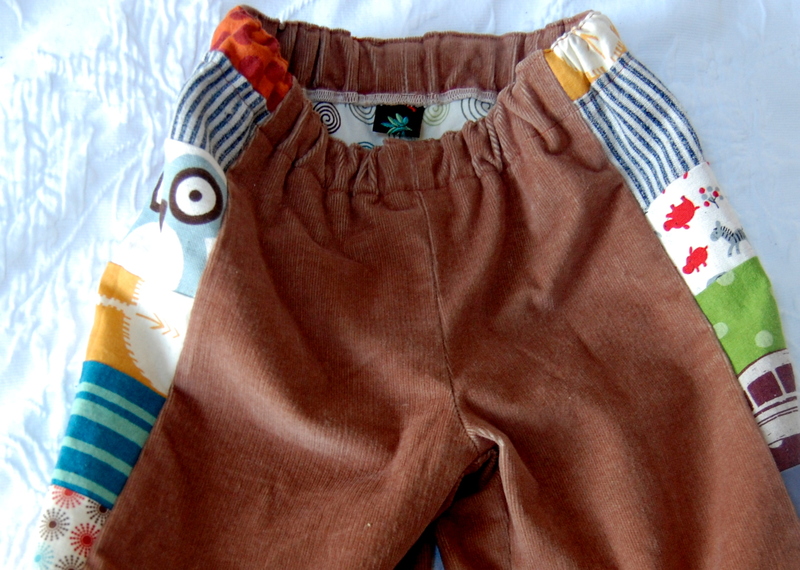 Now, you can skip the next few steps and move right onto sewing your pants together, but I decided to line these for my baby since there are so many seams. 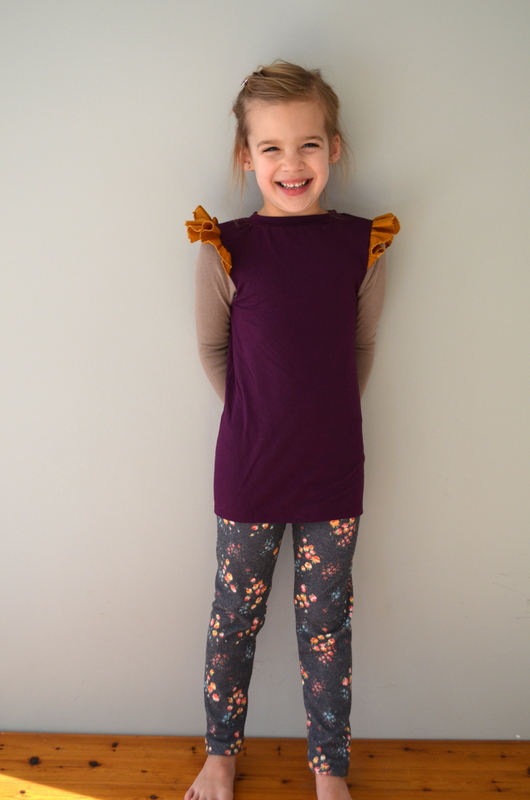 Lining pants is actually super easy and keeps everything nice and soft on the inside. 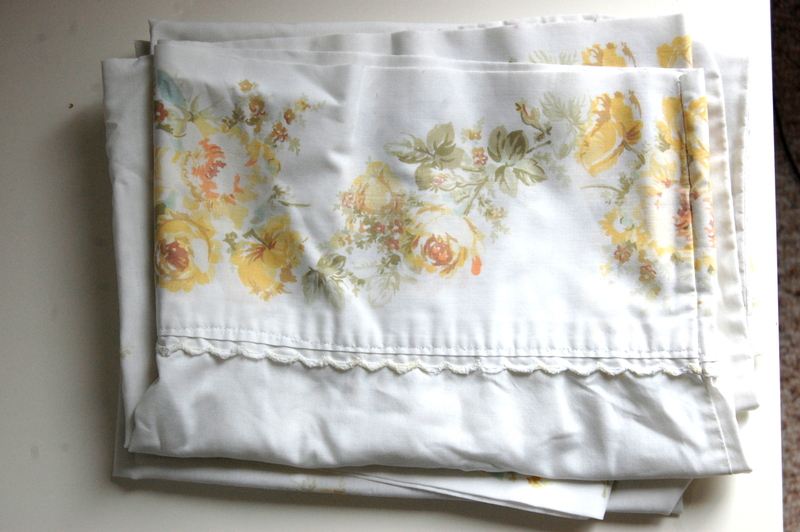 I’m using this vintage pillowcase since it’s really soft and thin. 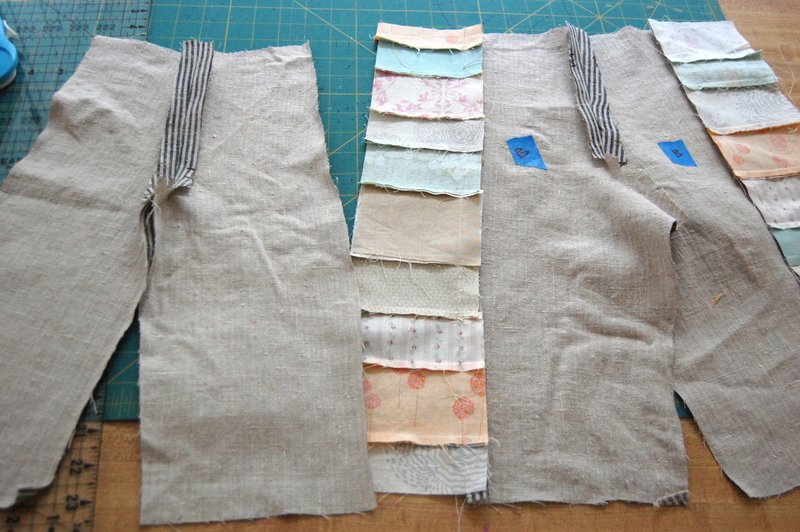 Using your new front and back pieces, lay them (folded) onto your (folded) lining fabric- easy to just use a pillowcase! Trace the pattern with a marker. 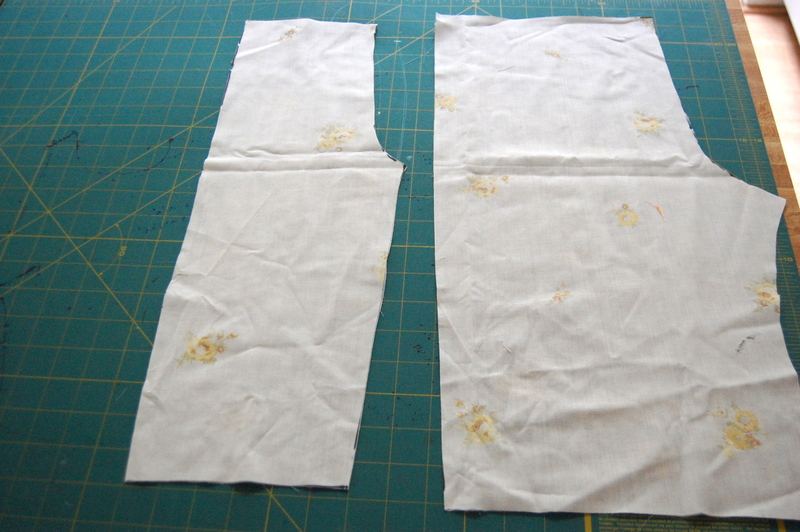 Sew the front pieces and back pieces the same way you did with your other pieces. 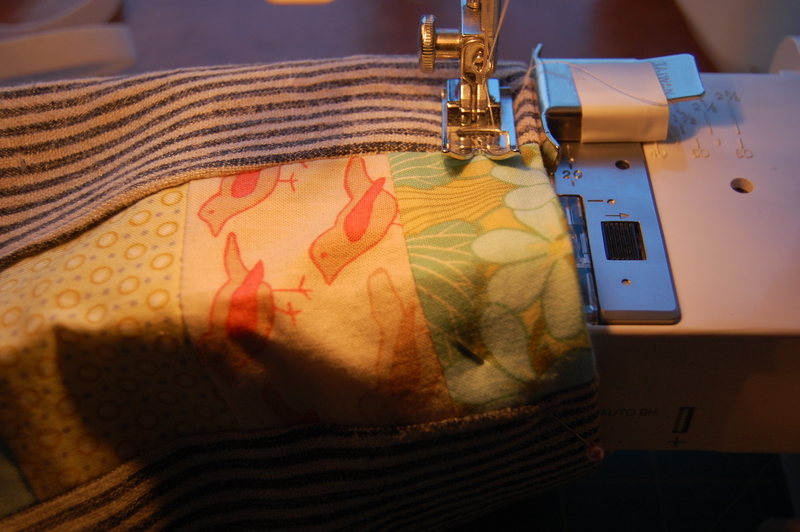 Clip curves at center, and press the seams open. 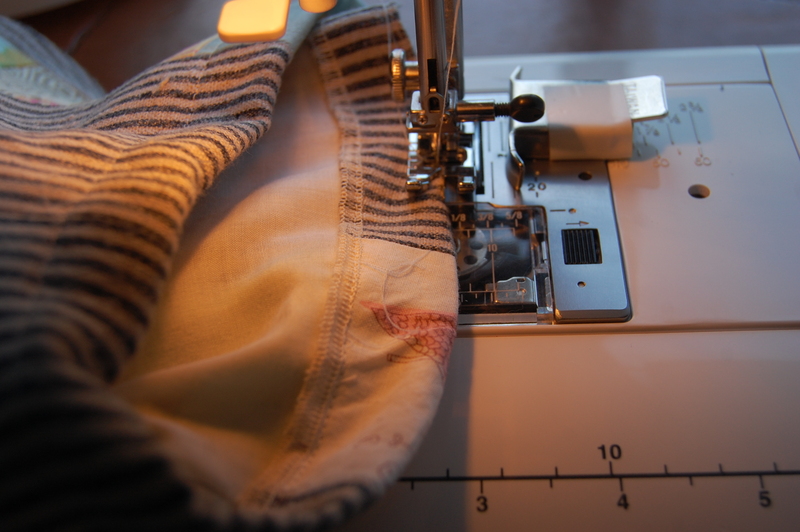 Time to sew up your pants! With right sides together, pin your front piece to your back piece. 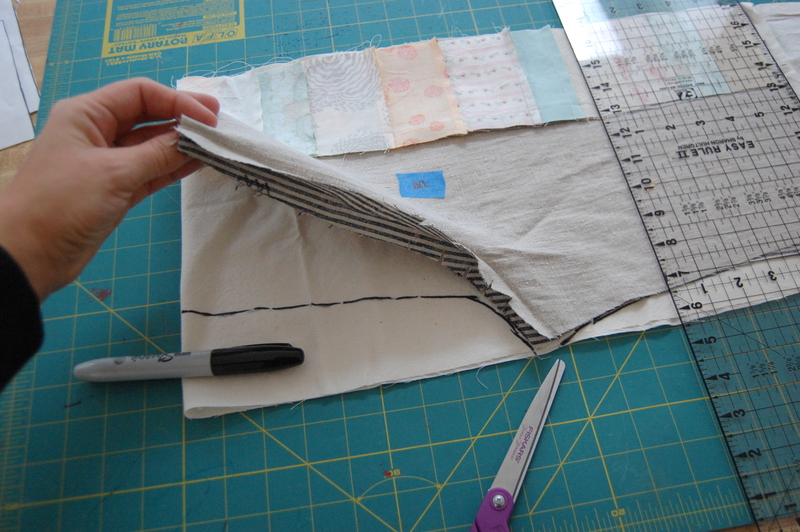 sew the sides first (i’m using a 5/8″ seam allowance). 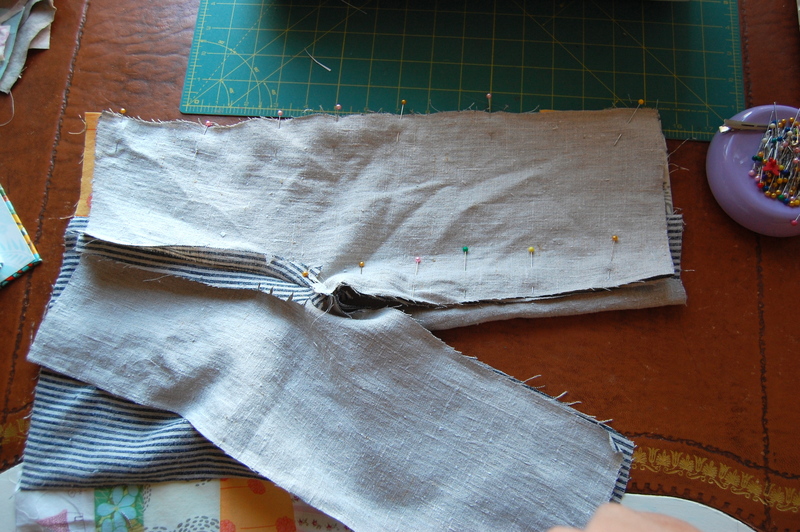 Next, sew the inside seam of your pants, starting at one leg… and ending at the other. 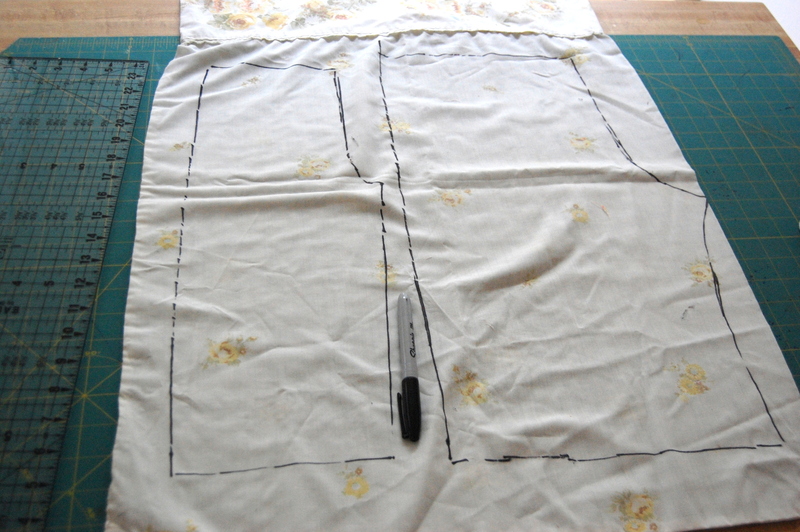 Now, put your lining pants together in the same way, sew the sides first… then the center…. 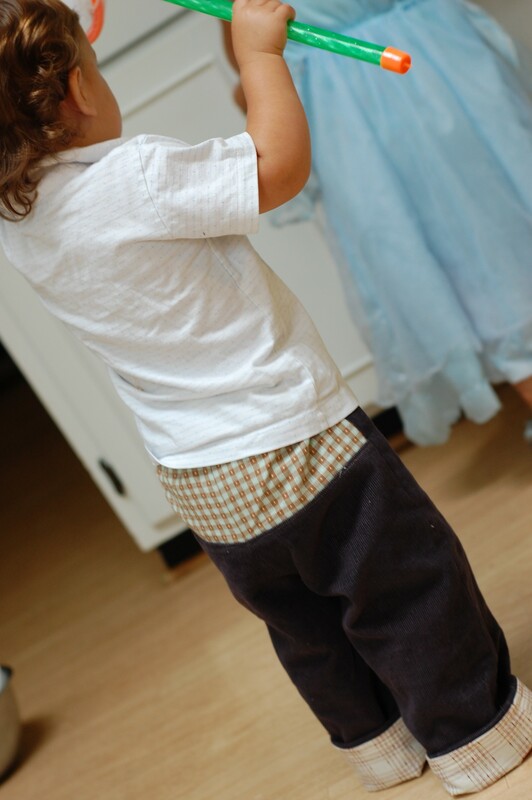 Okay, so turn your outer pants right side out, and keep your lining pants inside out. Fit your lining pants into the outer pants. 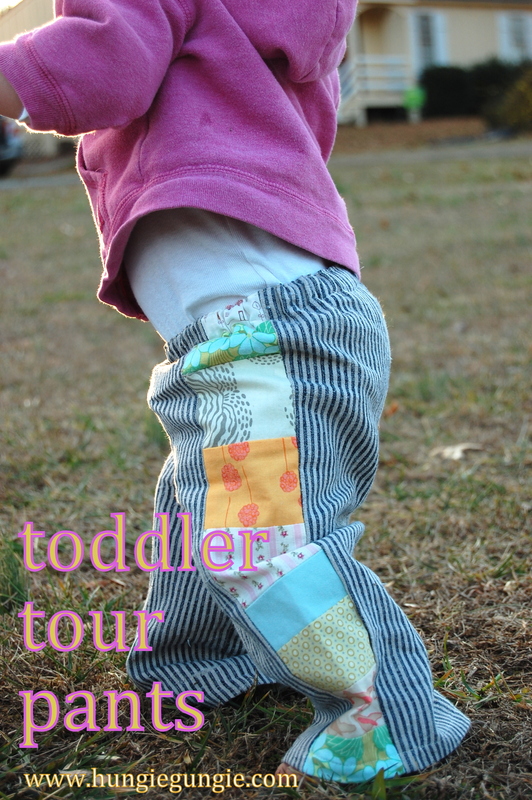 Pin the top raw edges of your pants, and run that edge through a serger if you have it. 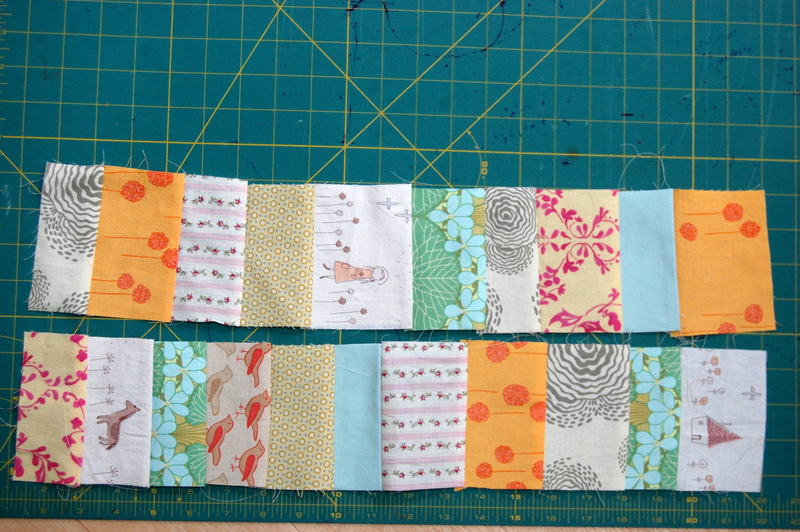 If not, you can zig zag stitch. 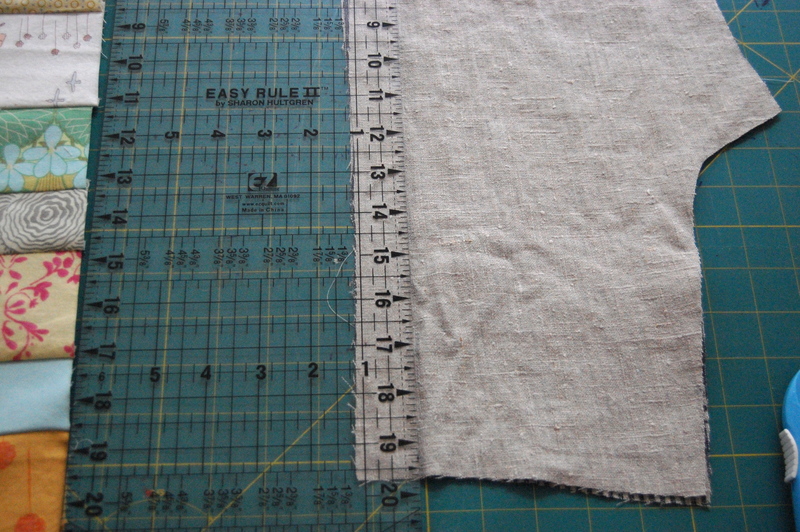 Now, fold your top edge over about 3/4″. 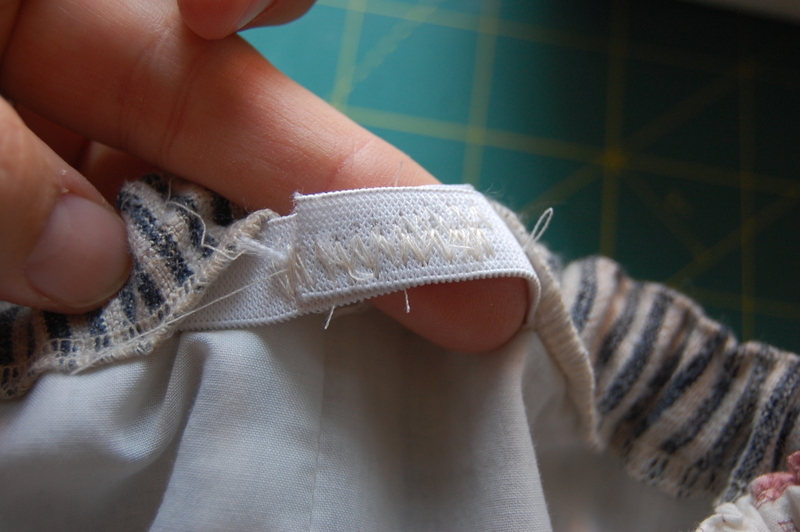 Using 2 pins, leave a 2″ space in the back of the pants to thread elastic. 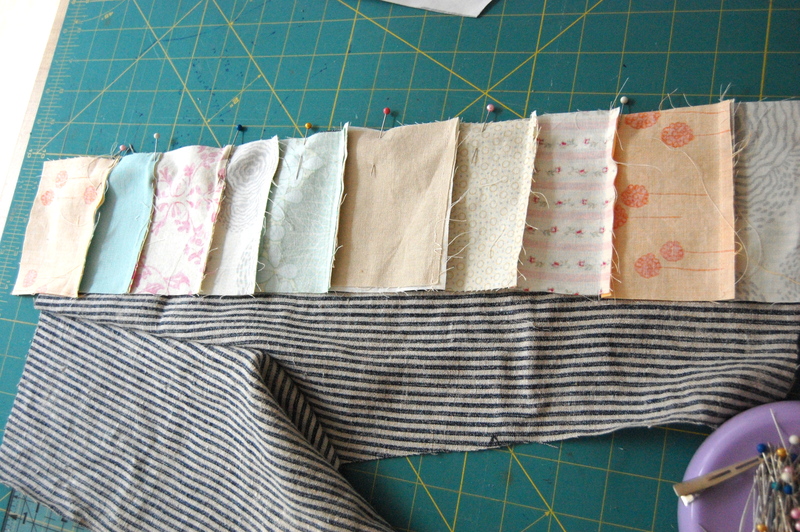 Topstitch all the way along the folded edge (i’m using an edgestich foot- love it!) as close to the edge as possible. 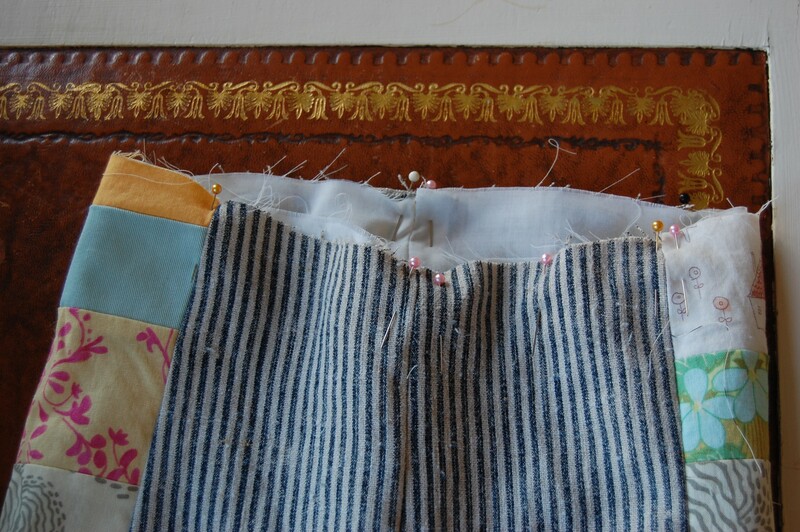 Then, Stitch along the serged edge to form the casing… just remember not to stitch where you have your 2 pins! 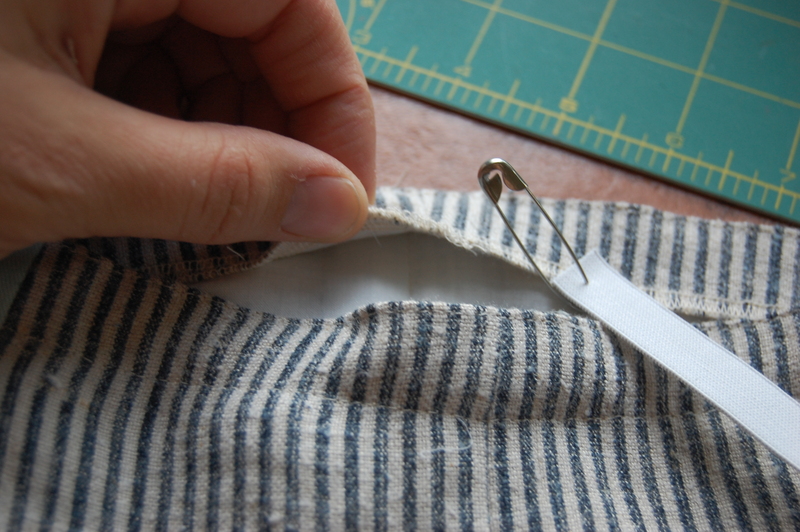 Slip a safety pin through one end, and thread the elastic (mine is 1/2″) on through your casing…. 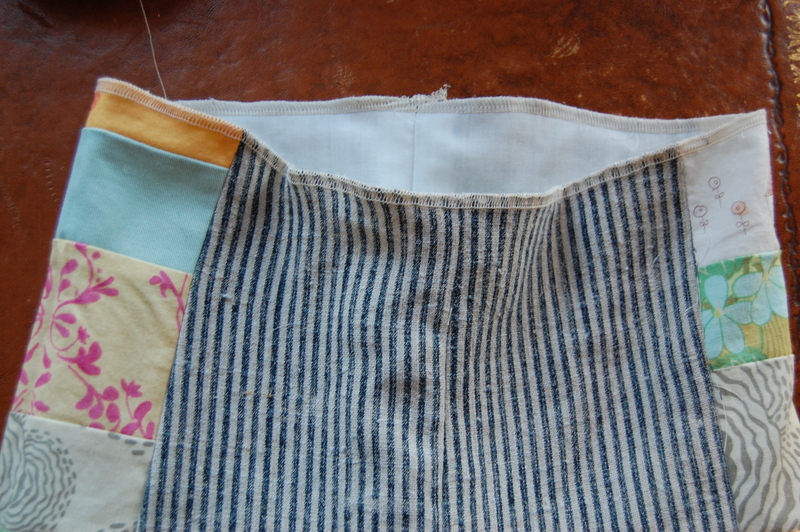 Once you get all the way around, bring the two ends together about an inch, and zig zag stitch to hold them together. 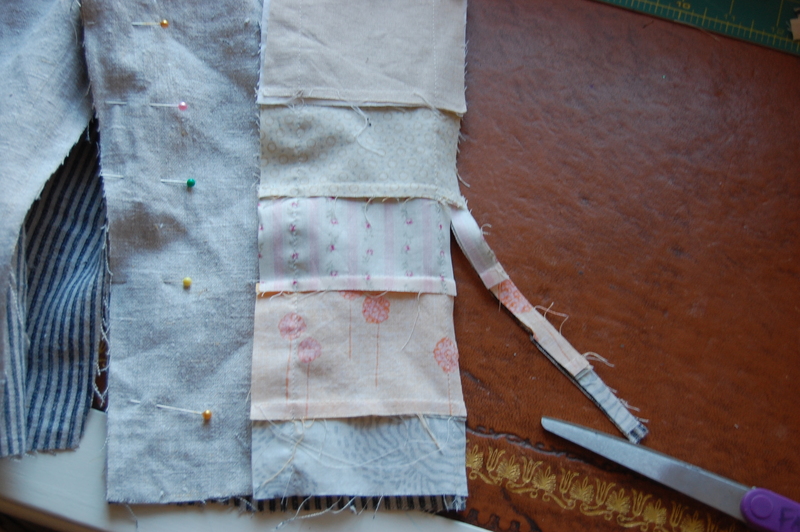 Pin a piece of folded ribbon into the opening at the back, and stitch then stitch it closed. 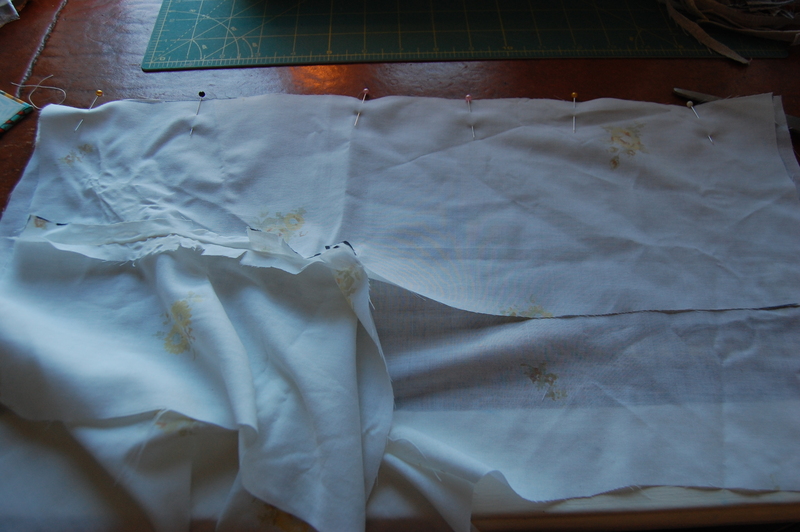 Then, fold your lining up the same amount and press. 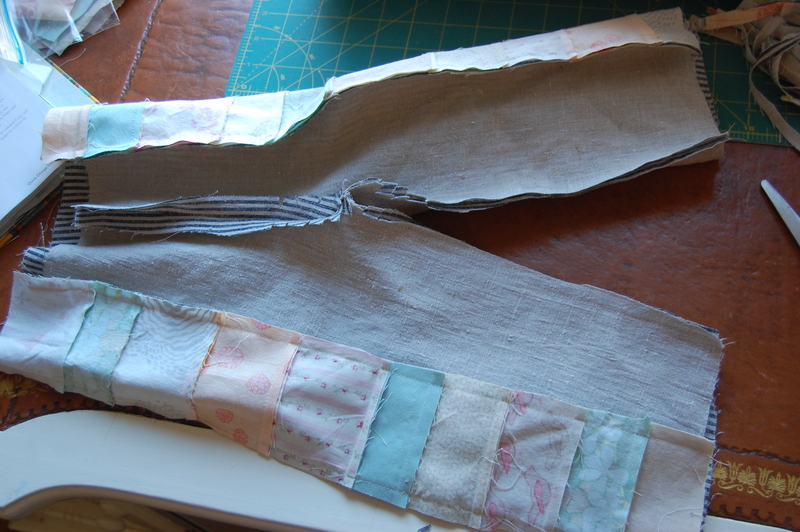 Sew around each leg hole… i sewed about 5/8″ from the edge. And you’re done! 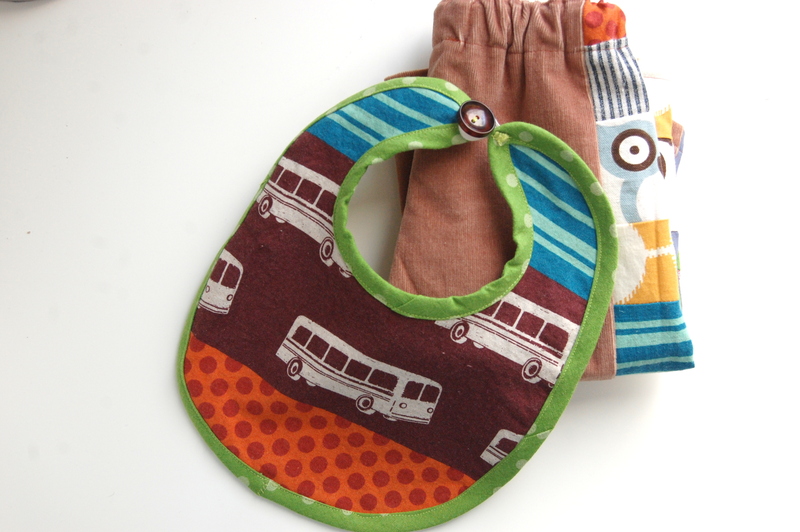 Your kid is ready to go out on tour! With people she doesn’t know! Or go bouncing around the room! (…or, the parking lot if she’s not so lucky). 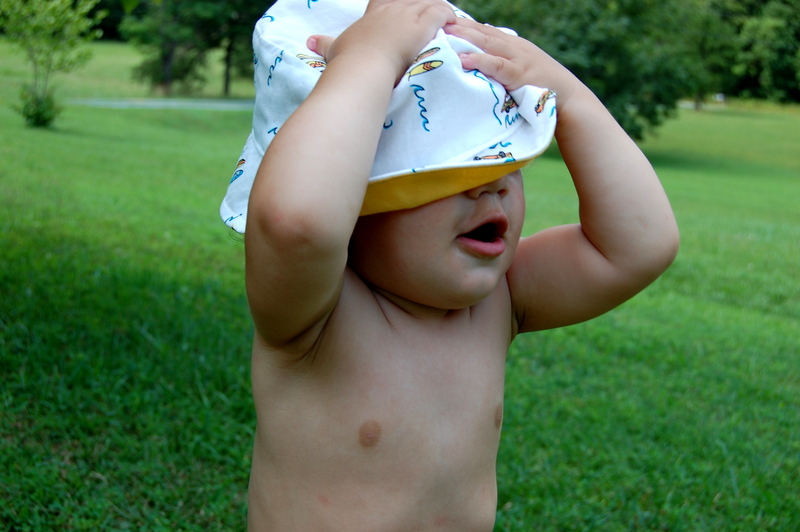 I’m kidding… just put them on your little babe, and enjoy the sunset…. 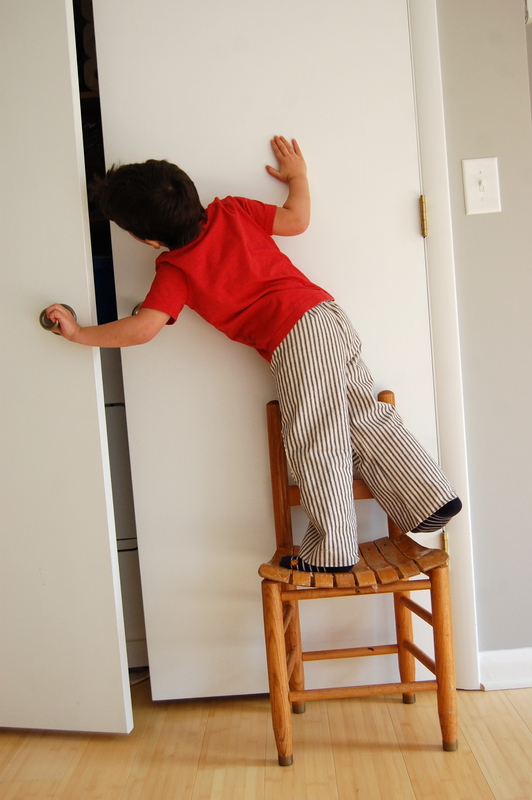 Anyone going out on Crib Tour 2013? 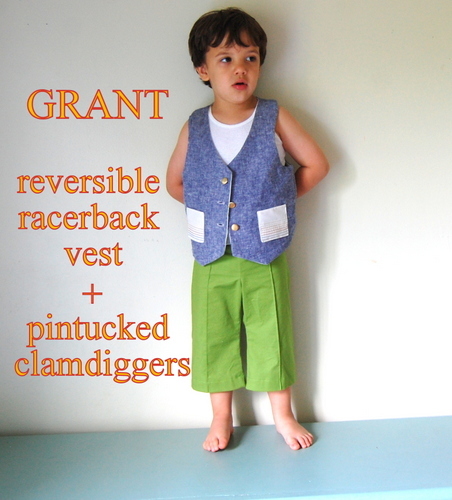 I couldn’t end my week of sewing without making something for my boy, Grant. 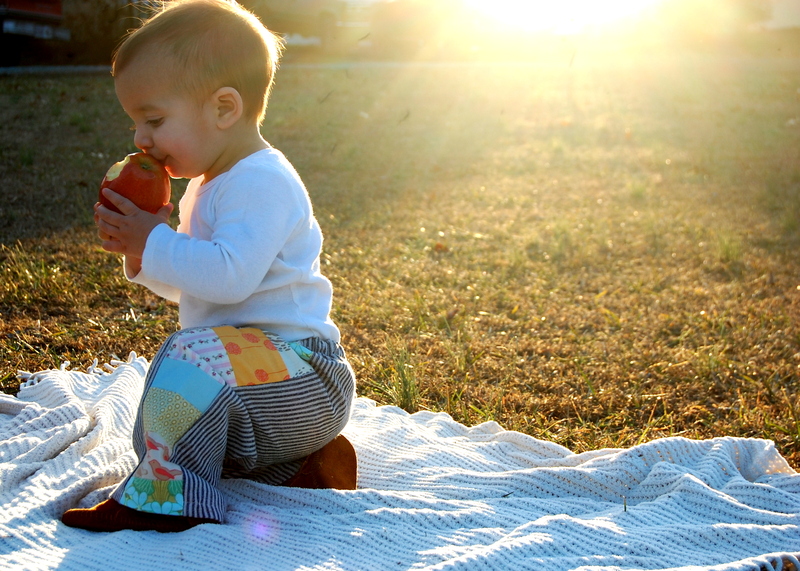 Nothing, too exciting here- except for the fact that he’s actually getting some homemade clothing love, which is rare in these parts! 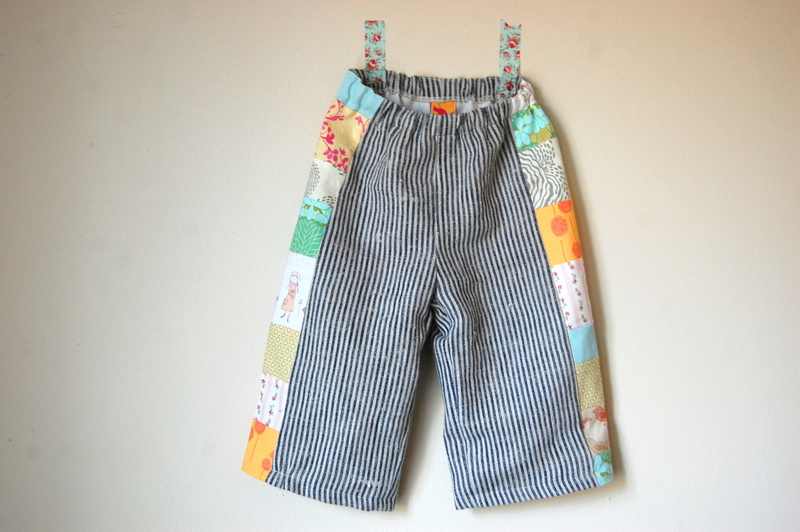 I used a the “quick-change trousers” pattern from Handmade Beginnings. 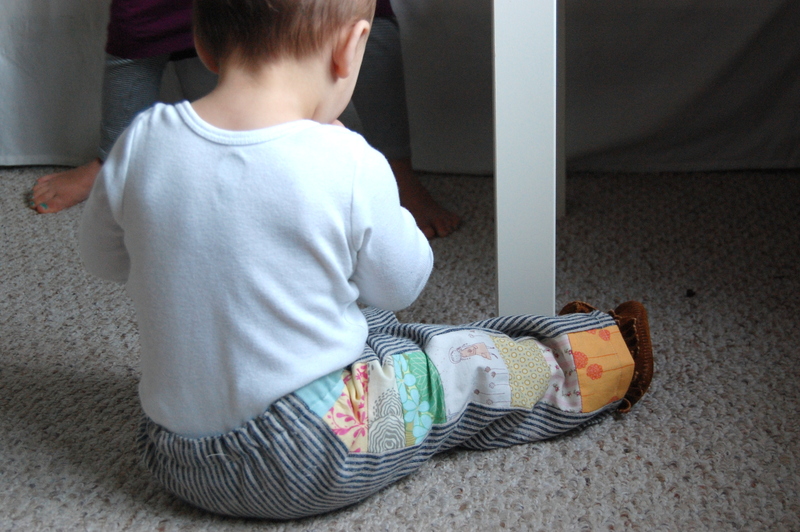 It took a long time to cut the pattern pieces and all the fabric since these pants are reversible. 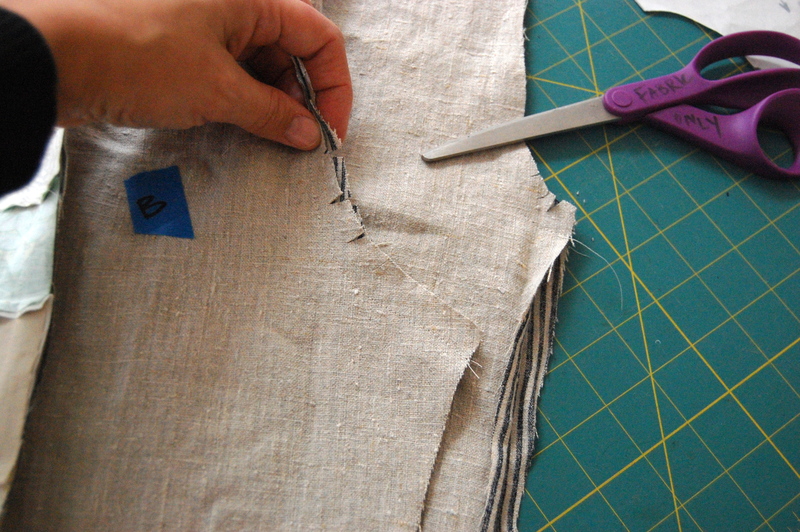 I had to scrounge for some boyish fabric… I had a lot of this charcoal blue corduroy, and some random clearance fabric. 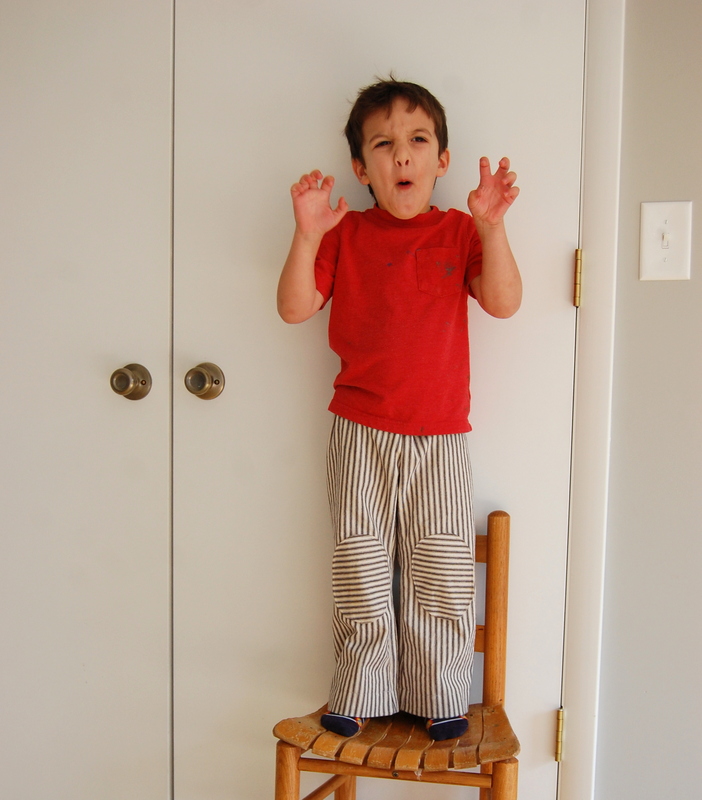 They definitely fit well, a tad big, but if he can do his normal thing like climbing on tables and chairs- I’m happy. 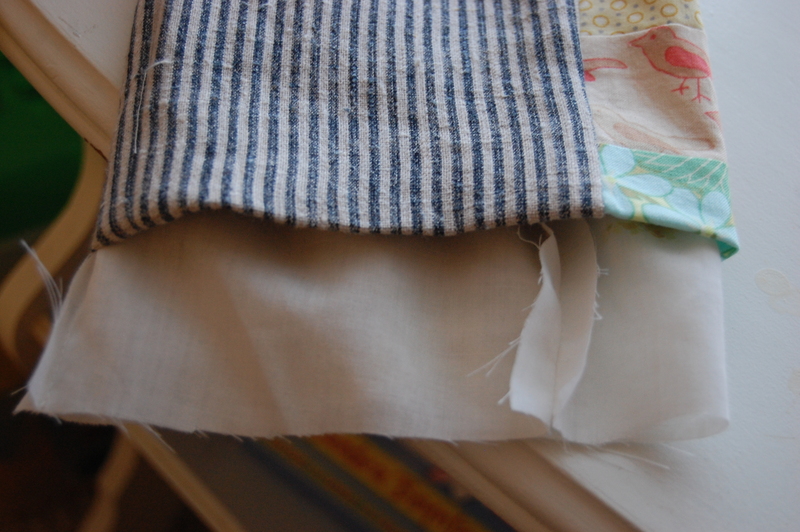 I’m glad I took part in KCWC this time around… I did my fair share of sewing, but I am definitely out of steam. 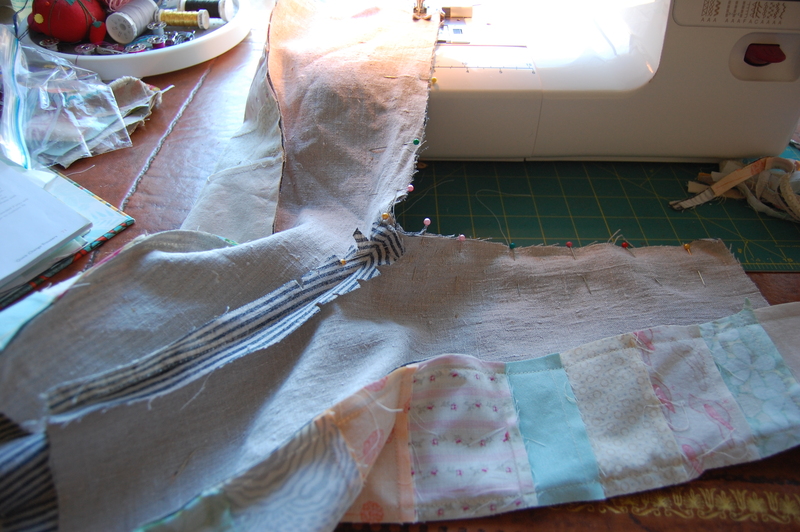 Looking forward to several days of beautiful weather while my sewing machine takes a nice long nap. 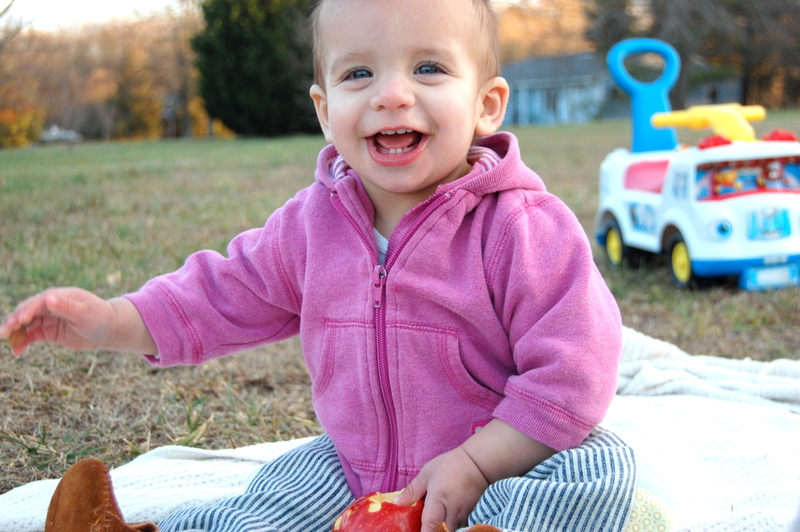 **one more thing… here’s Ellery actually wearing her new sweater. 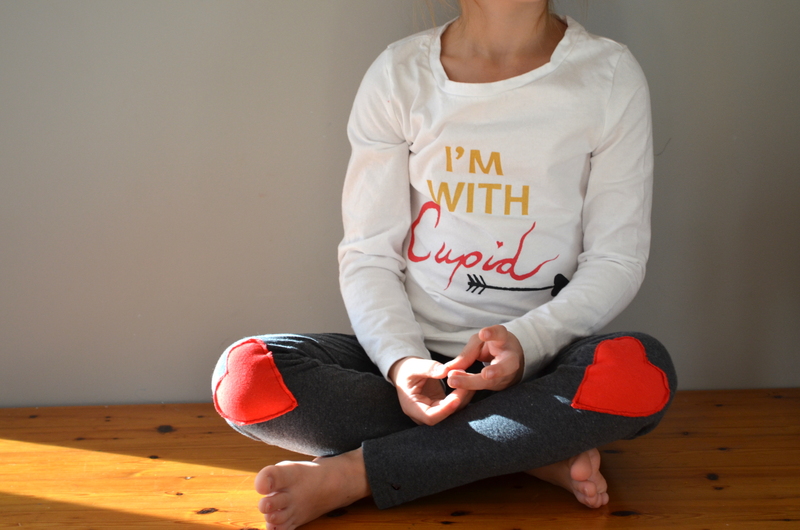 She kept it on for most of the day at preschool… success! It’s been a while since I’ve sewn anything for Grant… He’s gotten a couple of pairs of overalls and a mobile, a few other random things along the way…but nothing as of late. 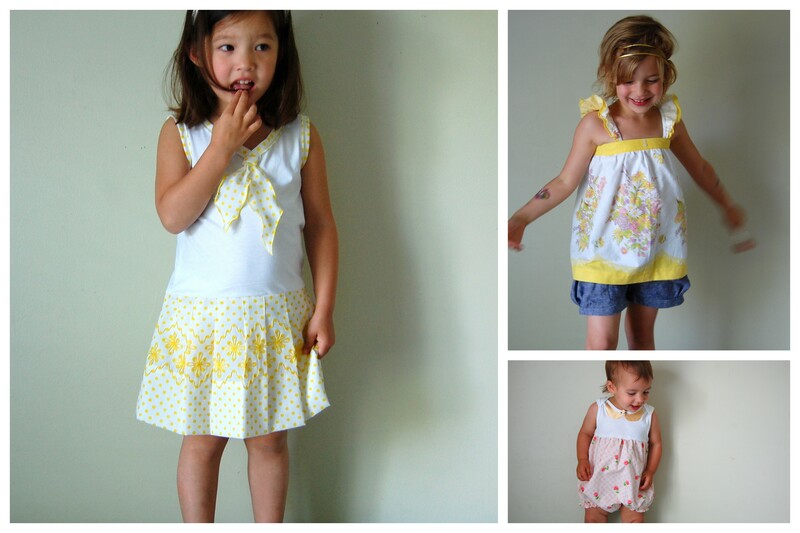 The pattern came from the book, Oliver + S Little Things to Sew. There are so many great little things to make from this book- I highly recommend it! 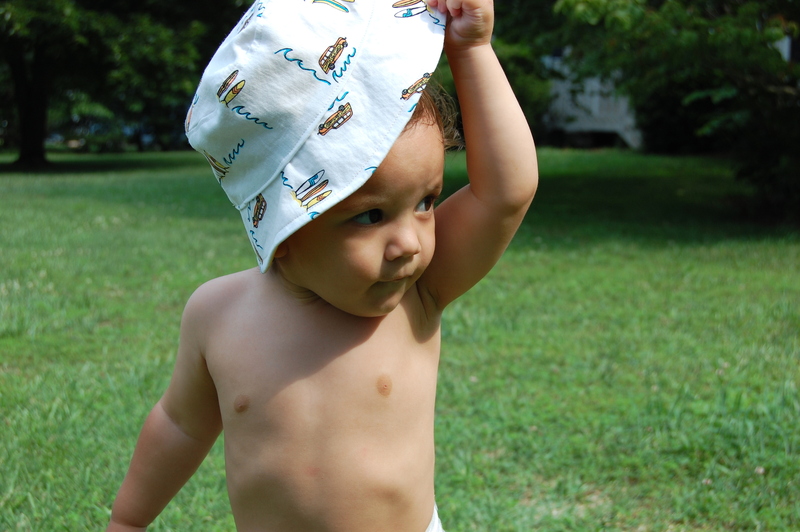 The hat is reversible- I lined this one with yellow twill. 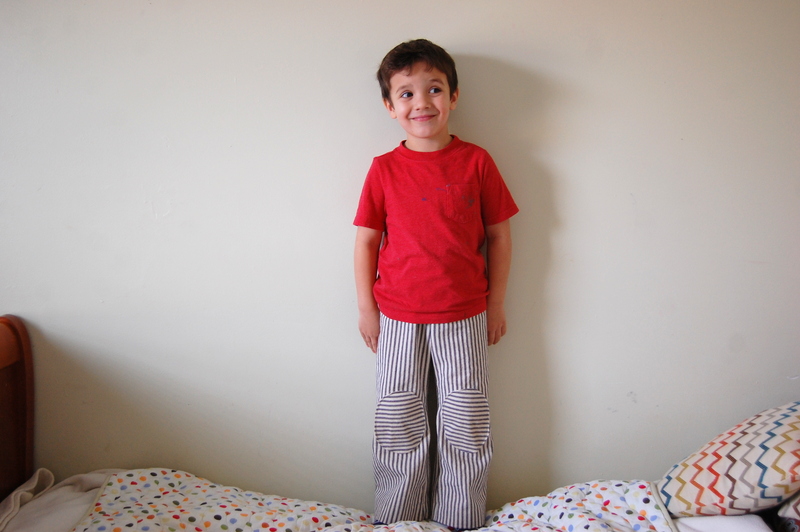 I had enough fabric to make a pair of comfy pants… I drafted a pattern from an old pair of pants and they seem to fit him perfectly.